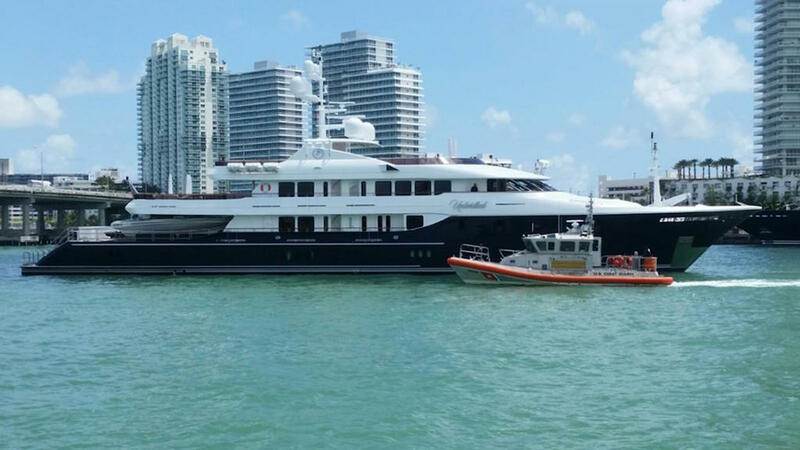 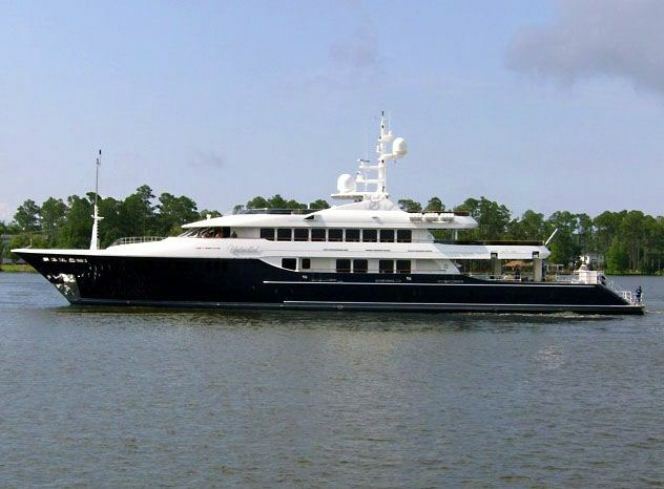 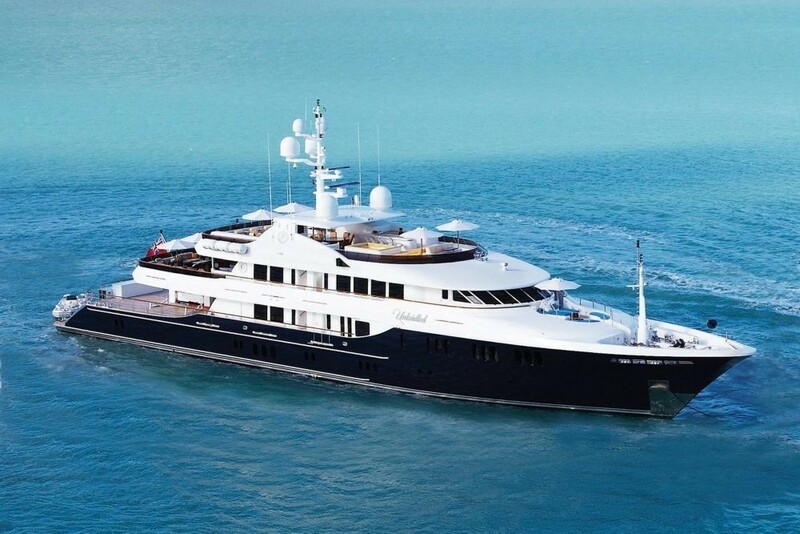 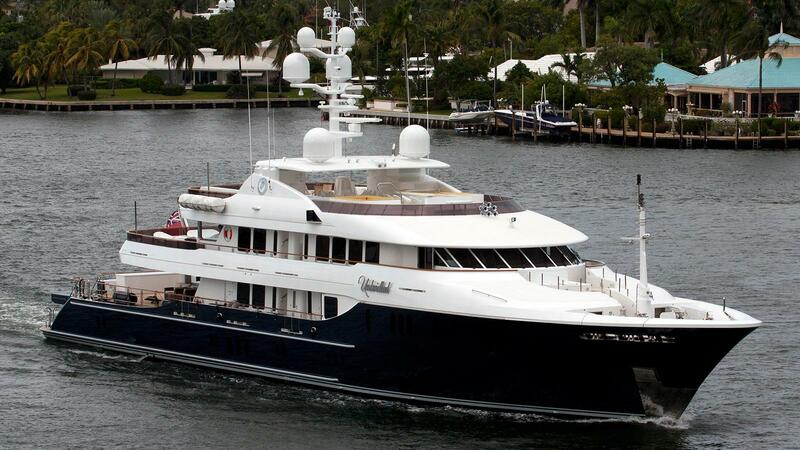 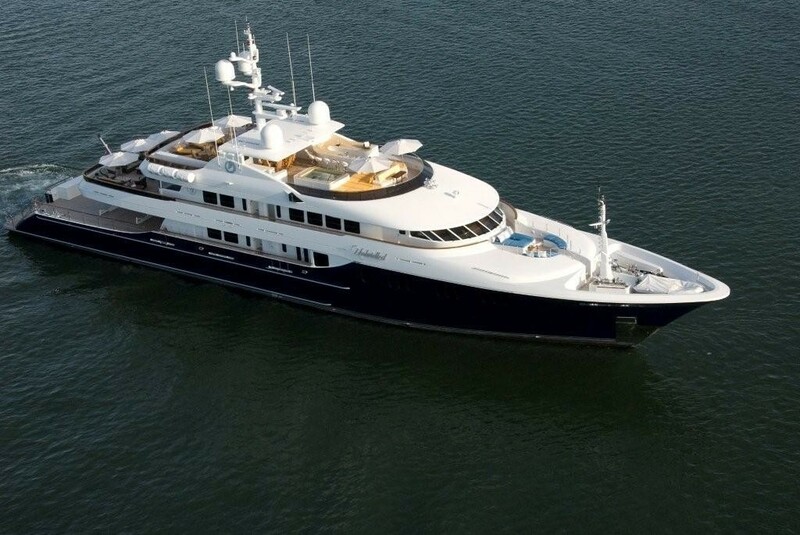 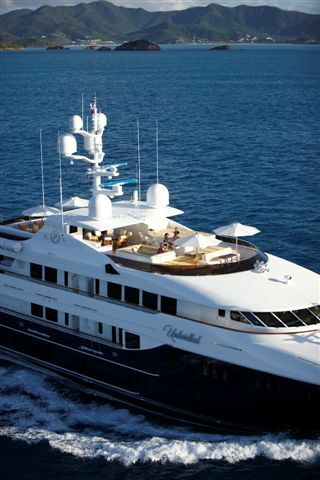 Motor yacht UNBRIDLED is a 58,20m (190' 11") superyacht which was built by Trinity Yachts in 2009. 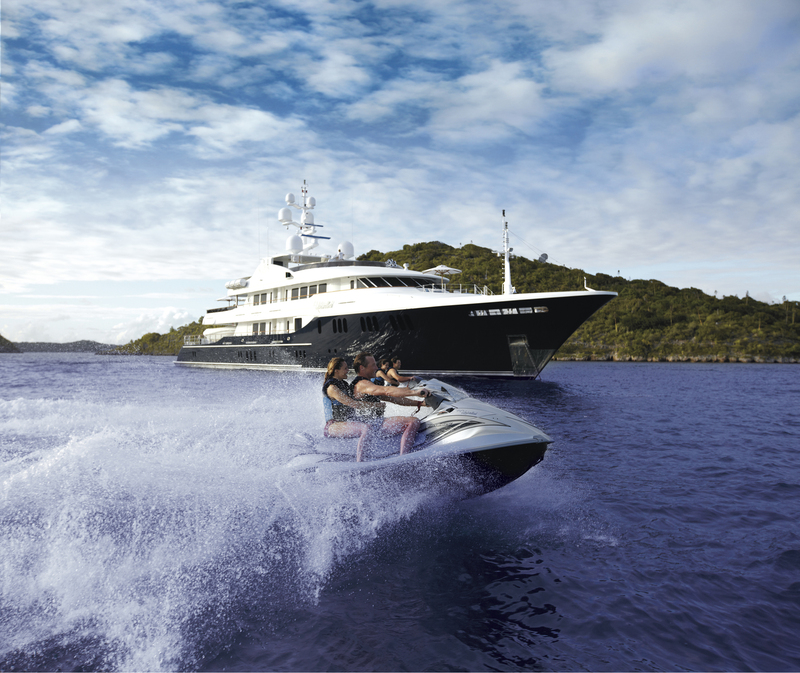 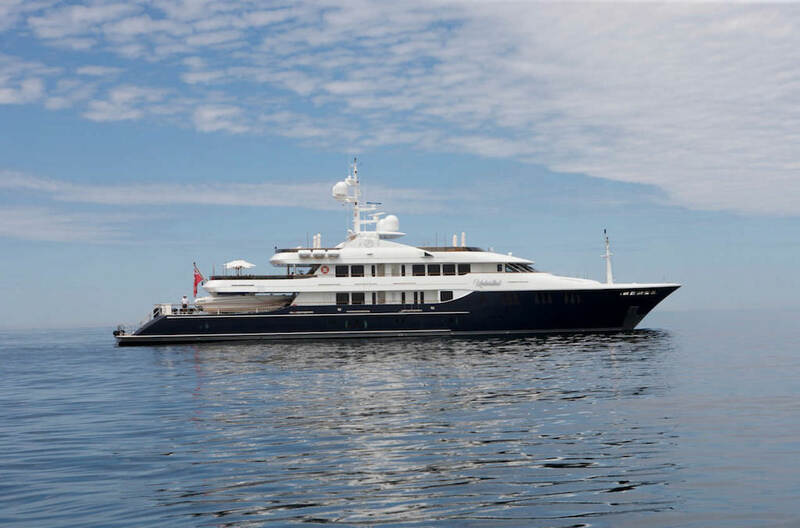 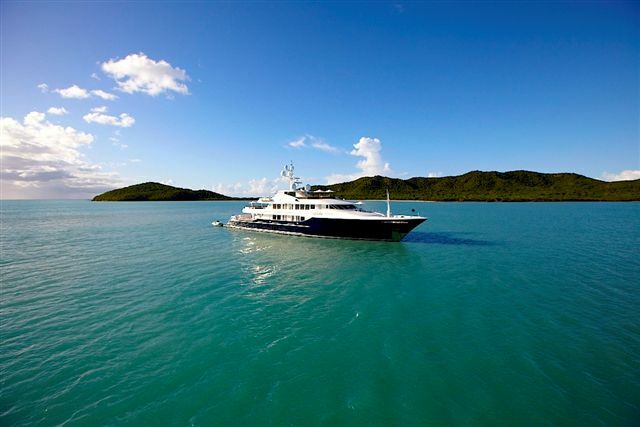 She was designed by Geoff Van Allen and boasts a strikingly impressive dark blue aluminum hull and white superstructure. 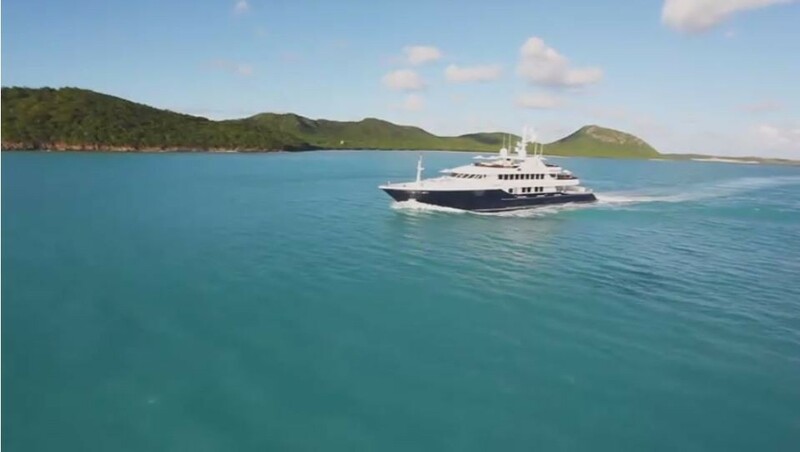 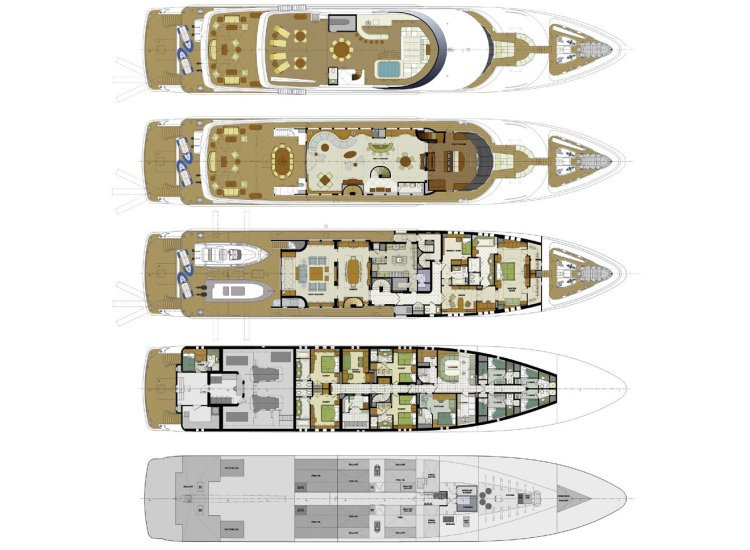 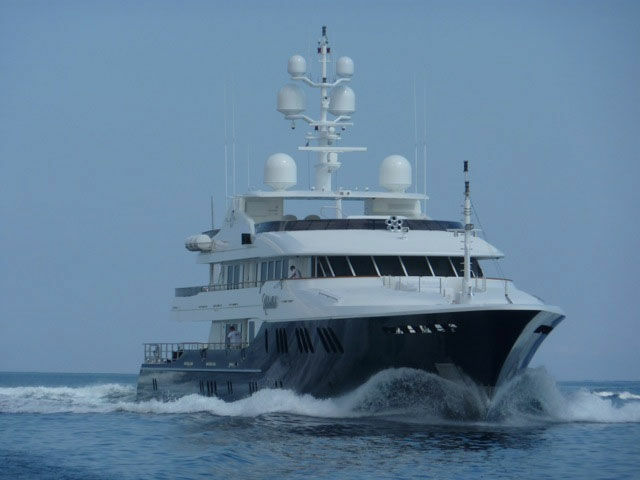 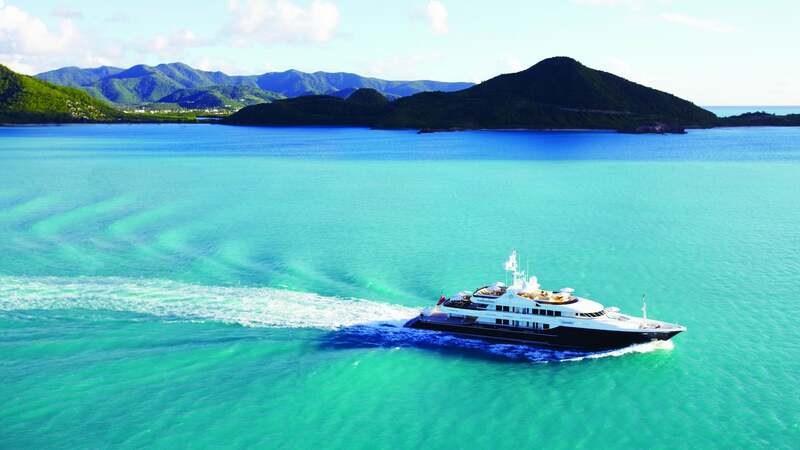 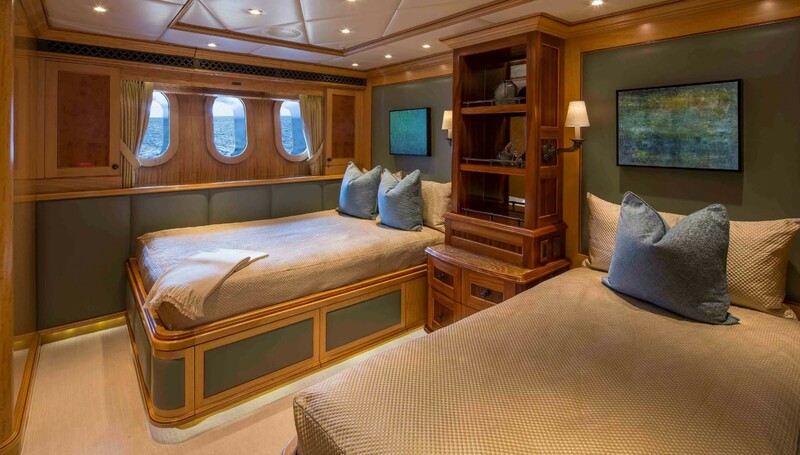 The tri-deck designed UNBRIDLED is available for deluxe crewed charters and can accommodate up to 12 guests in 6 cabins. 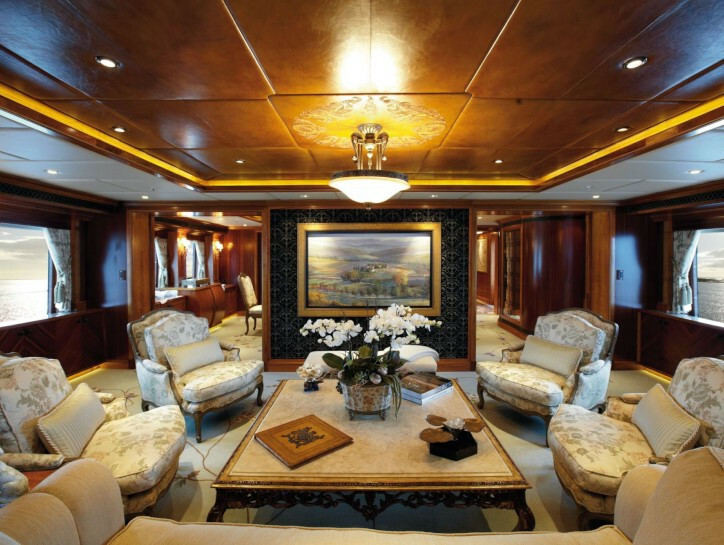 The interior design by Patrick Knowles and has a refined traditional ambiance, boasting exquisitely inlaid woods, luscious marbles, and intricate finishes. 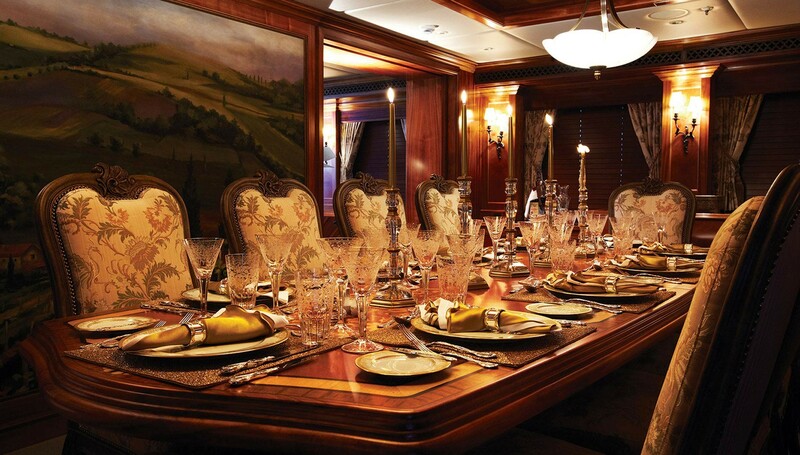 The attention to detail has created a truly unique and intriguing atmosphere. 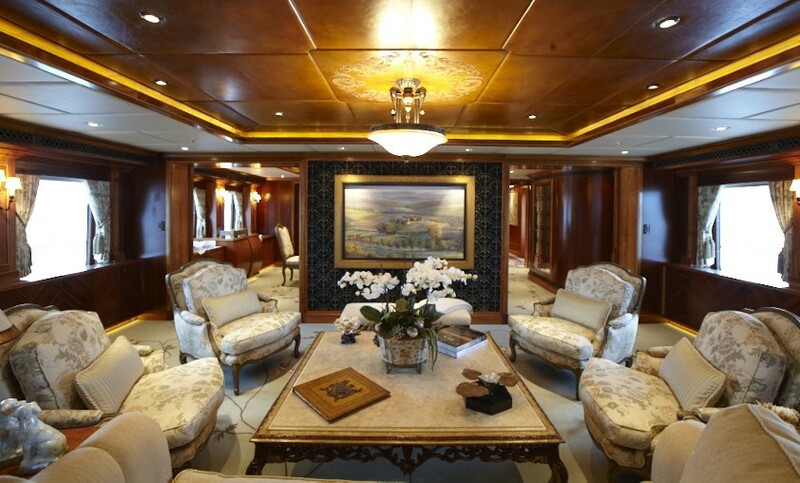 Guests have plenty of indoor options including a generous salon, elegant formal dining room, well-appointed sky lounge and spacious accommodation. 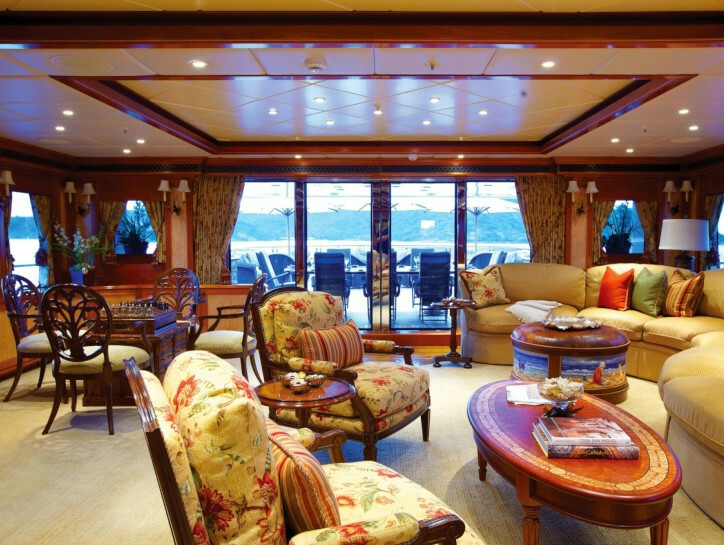 The salon is on the main deck offers ample seating in an inviting social atmosphere, surrounding a generous coffee table. 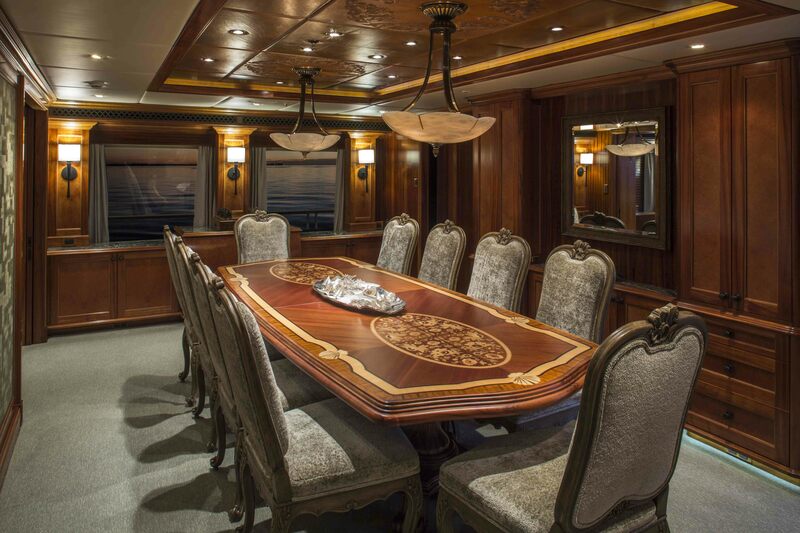 Forward of the lounge, the formal dining space is impressive and seats all guests comfortably. 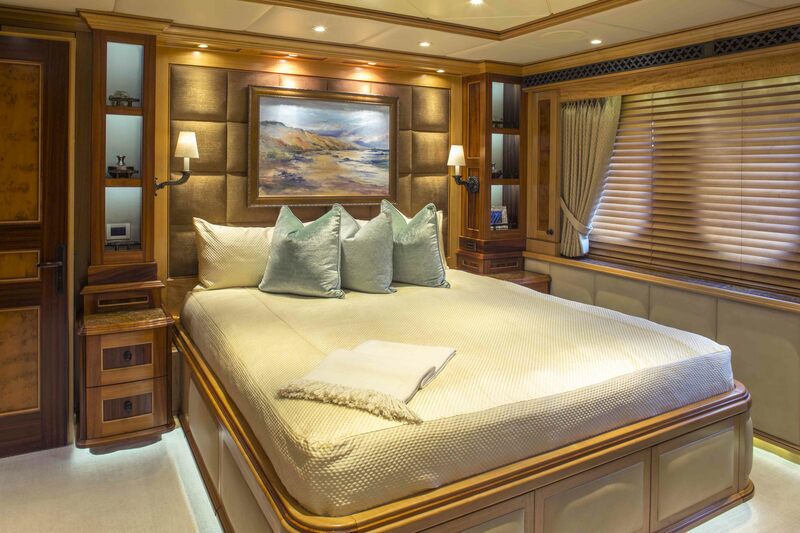 On the main deck, forward of the salon and dining, is the full beam master cabin offering a king size bed, his and hers wardrobes, study and spacious en-suite facilities. 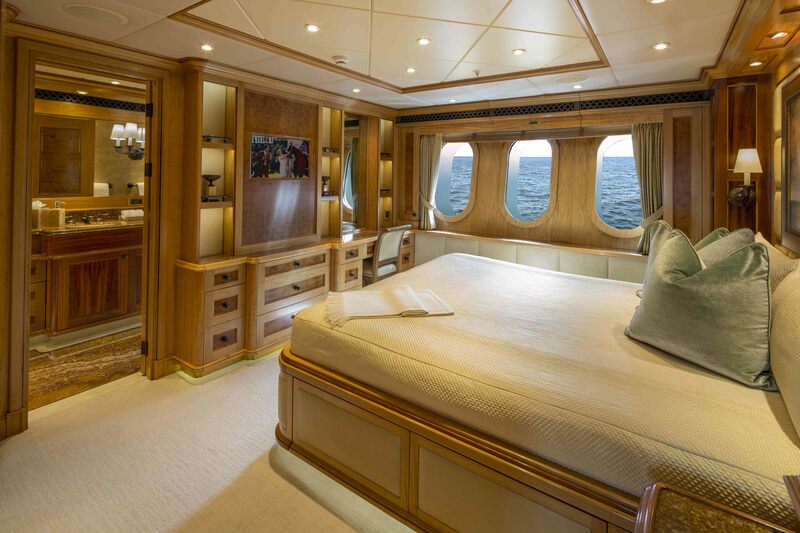 Further guest accommodation is below decks in 2 VIP and two guest cabins. 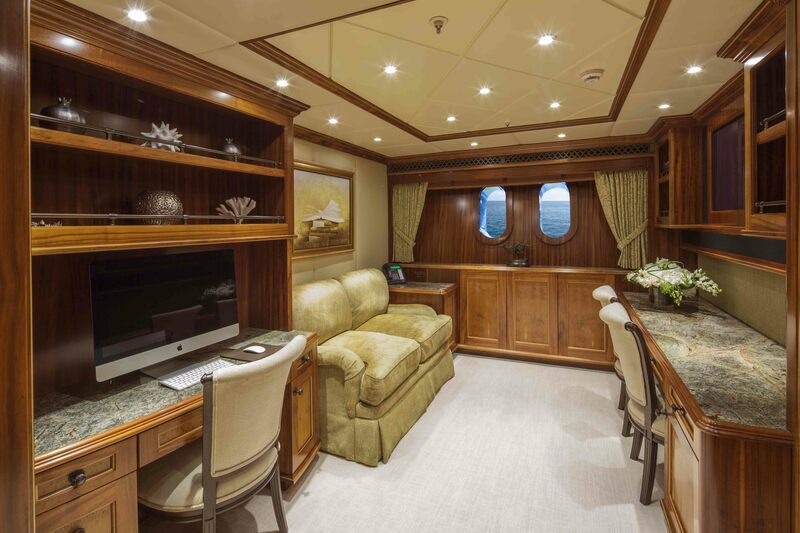 An additional guest cabin is available on the main deck, in a convertible office to twin or double layout, complete with en-suite facilities. 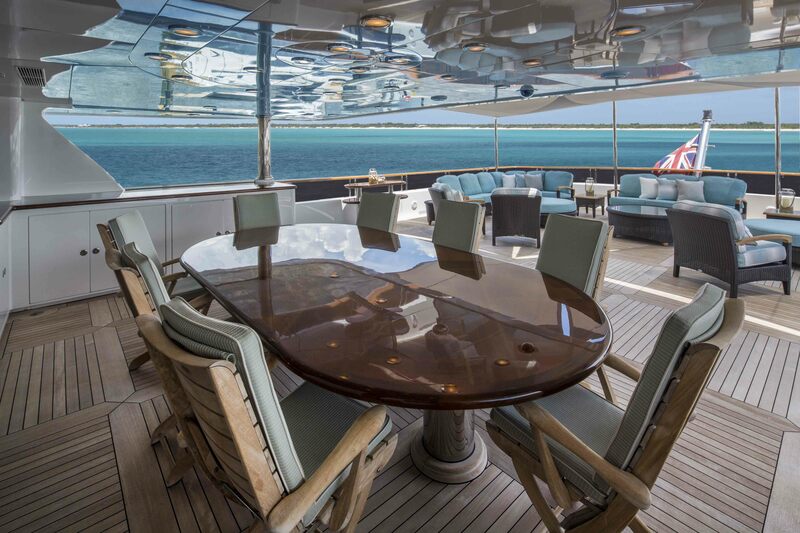 M/Y UNBRIDLED boasts a fabulous sky lounge ideal for entertaining, offering idyllic views from panoramic windows, plush seating, coffee tables, games tables and elegant wet bar. 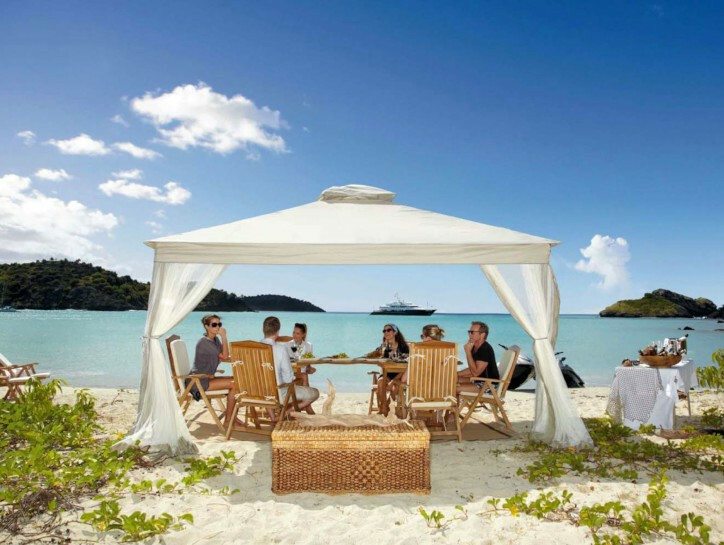 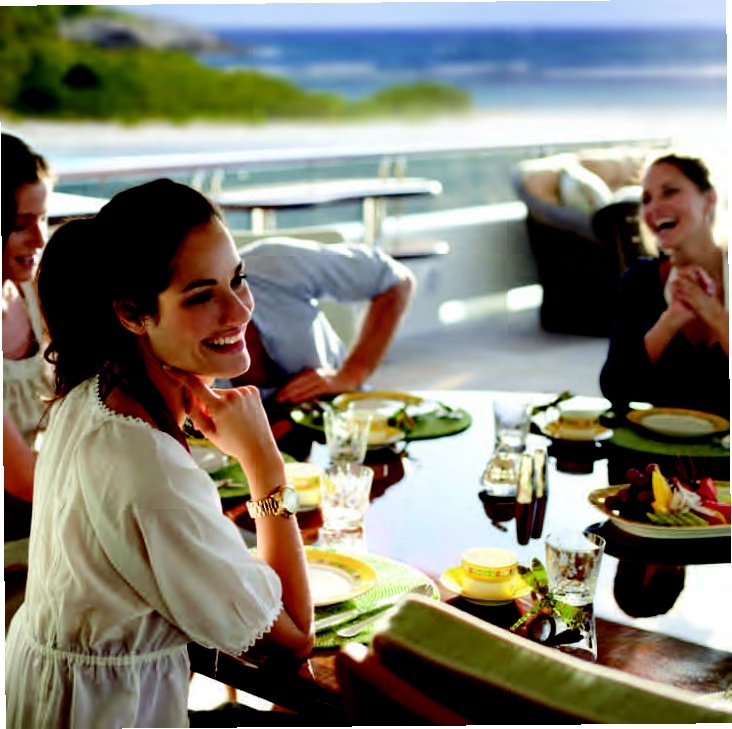 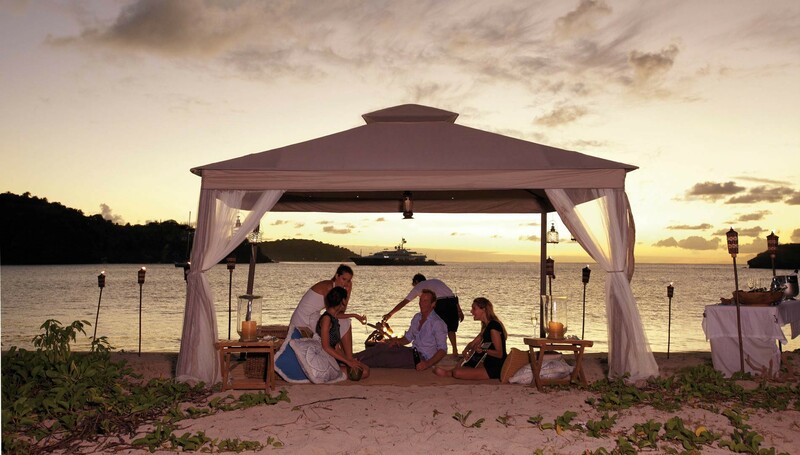 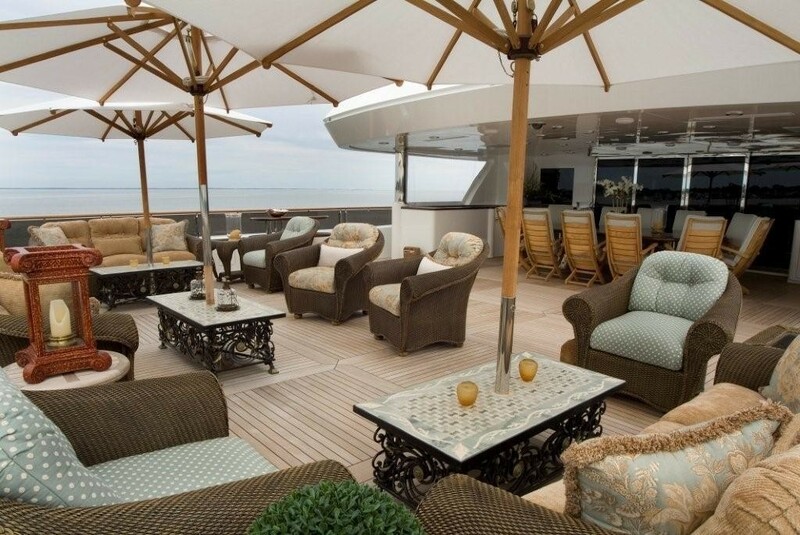 The exterior offers plenty of relaxing options, including three alfresco dining choices. 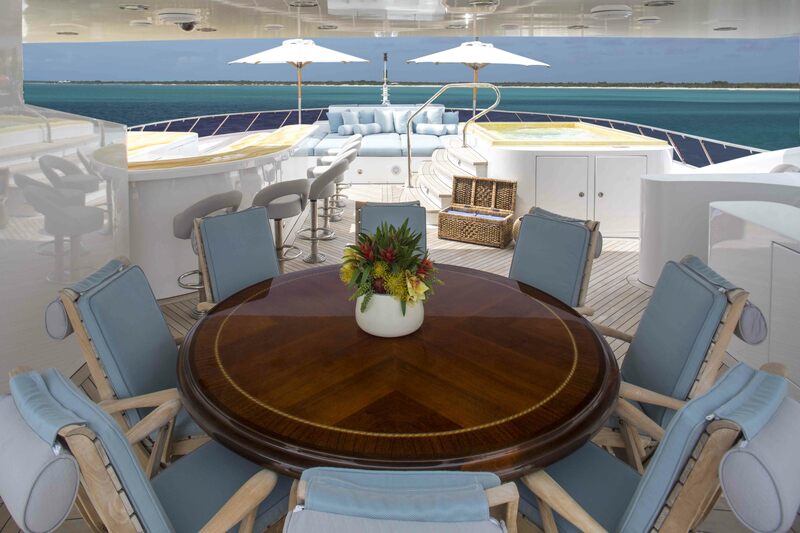 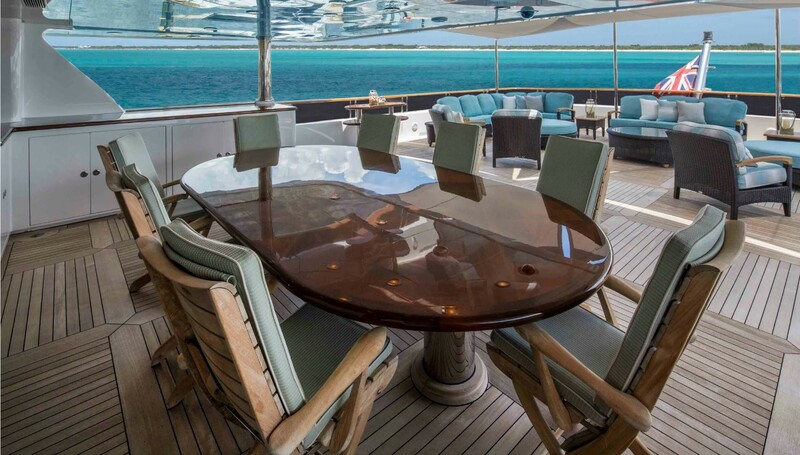 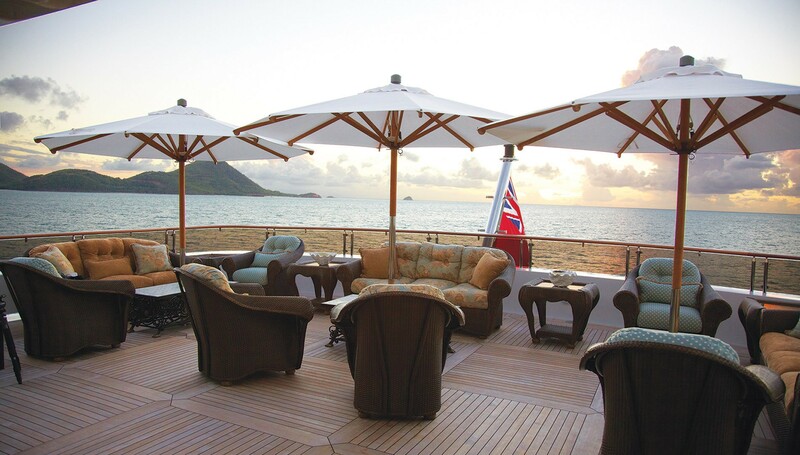 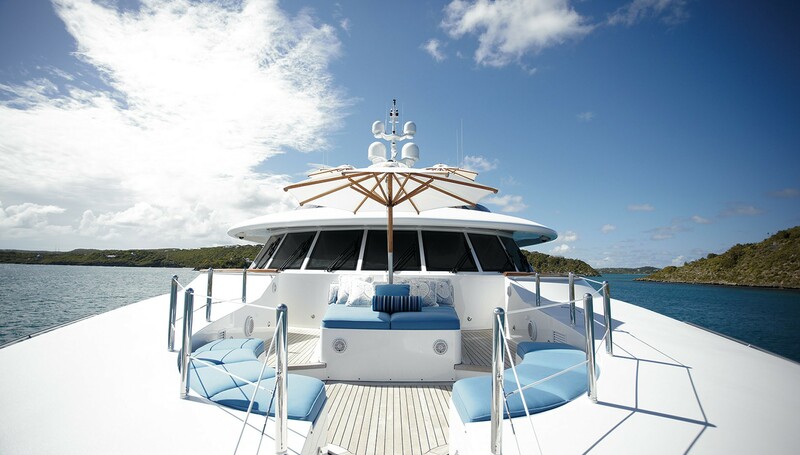 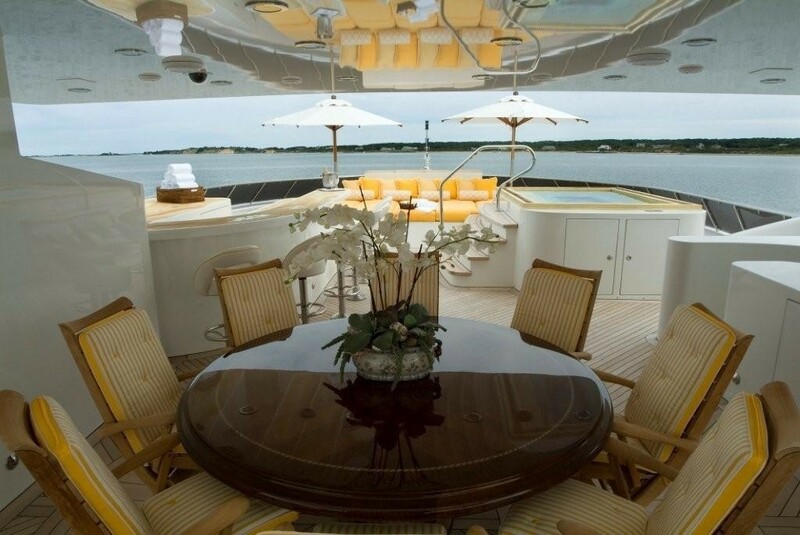 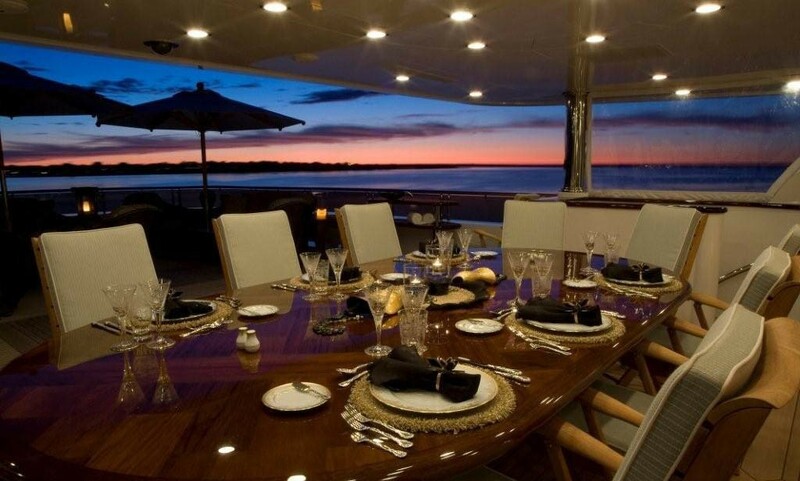 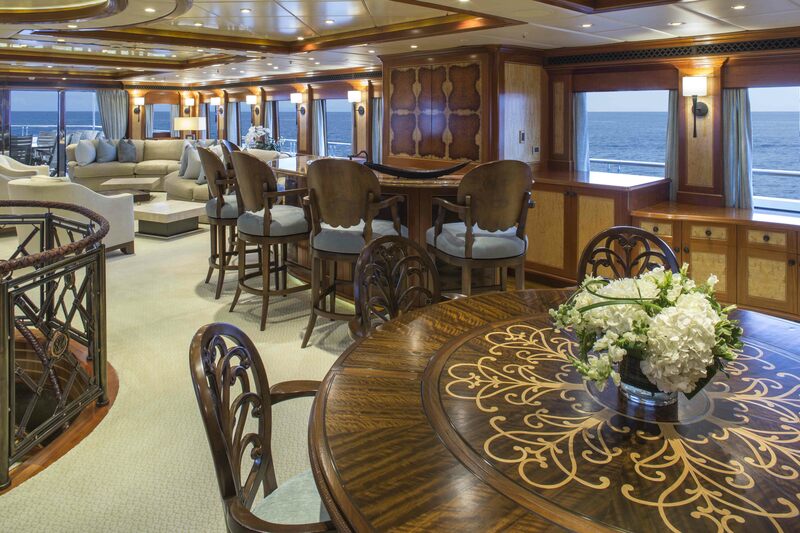 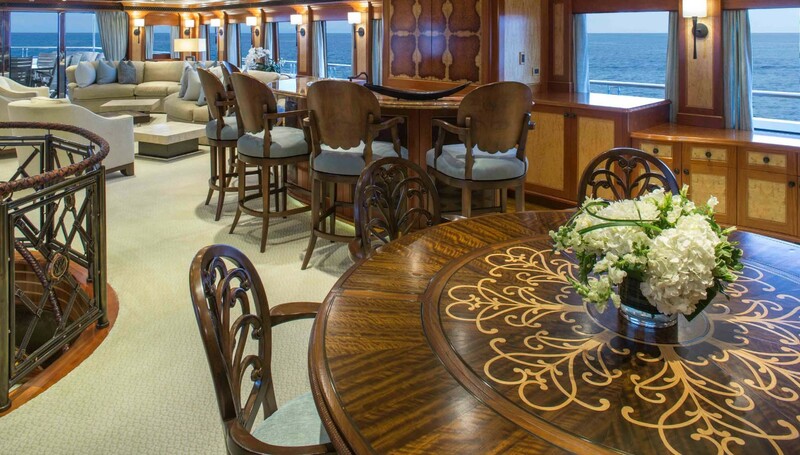 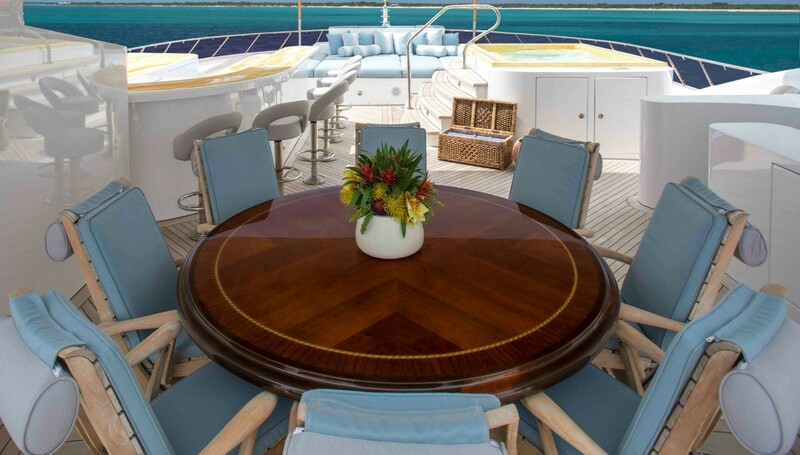 The main aft deck is shaded and boasts a formal alfresco dining table. 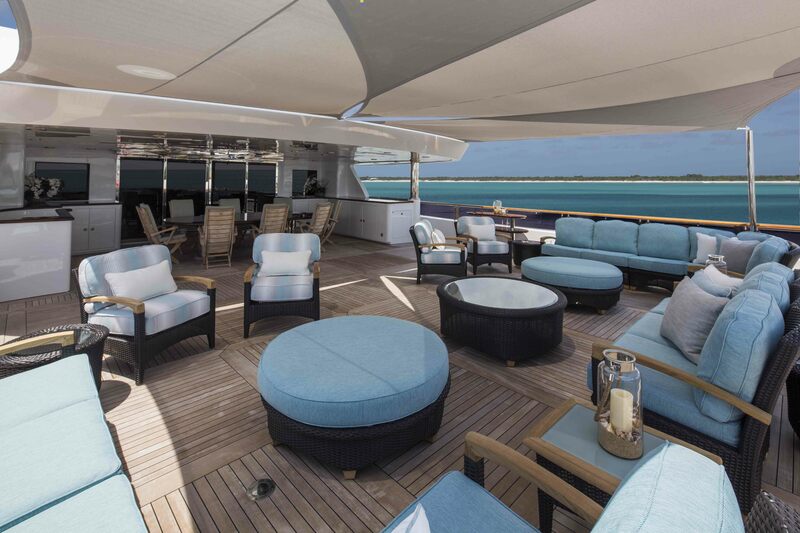 Above, the sky lounge opens out on a generous bridge deck, with a further alfresco dining option, wet bar and outdoor lounge seating, ideal for formal and informal occasions. 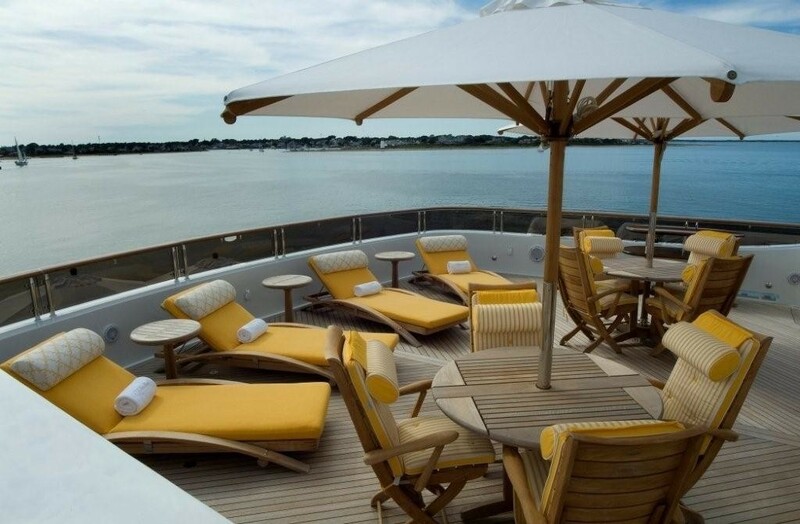 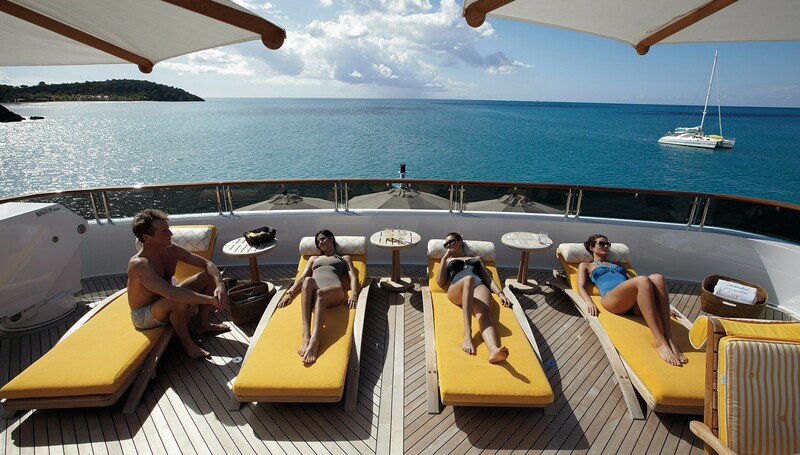 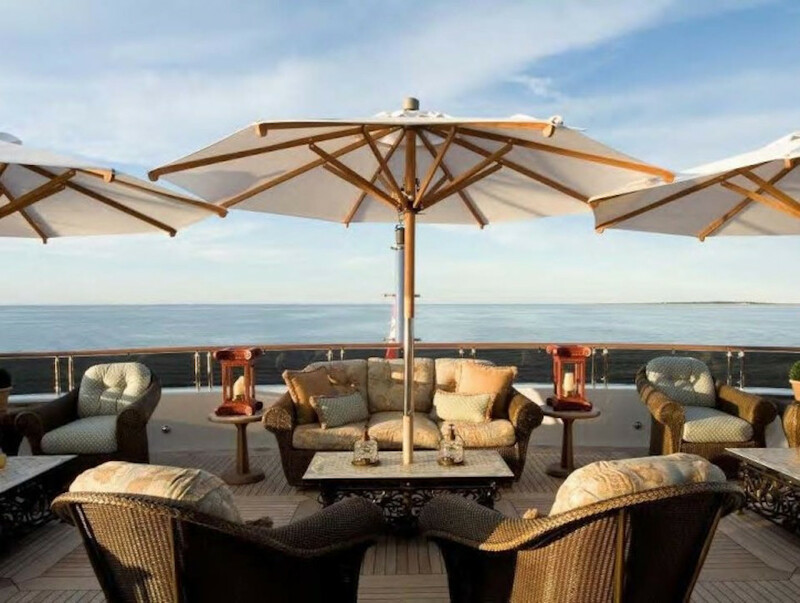 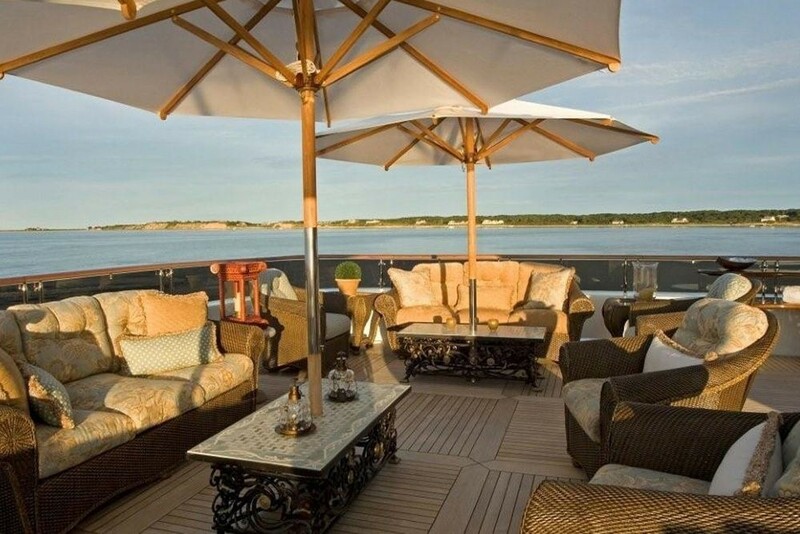 Forward on the bridge deck, a Portuguese style deck boasts an intimate sun pad, seating, and optional shade. 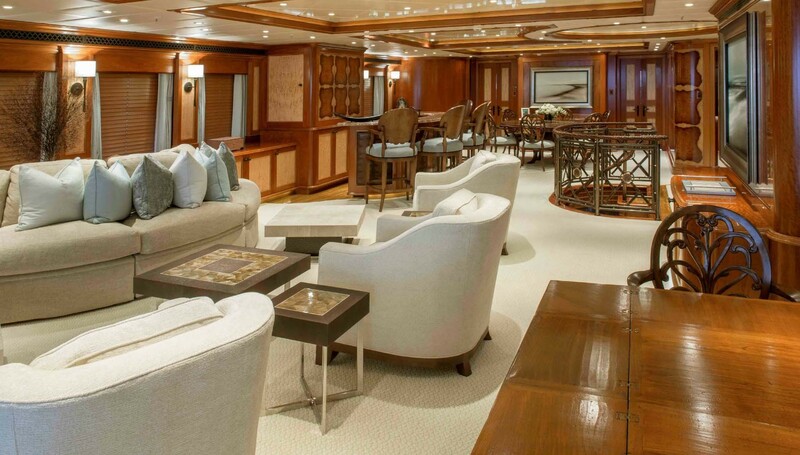 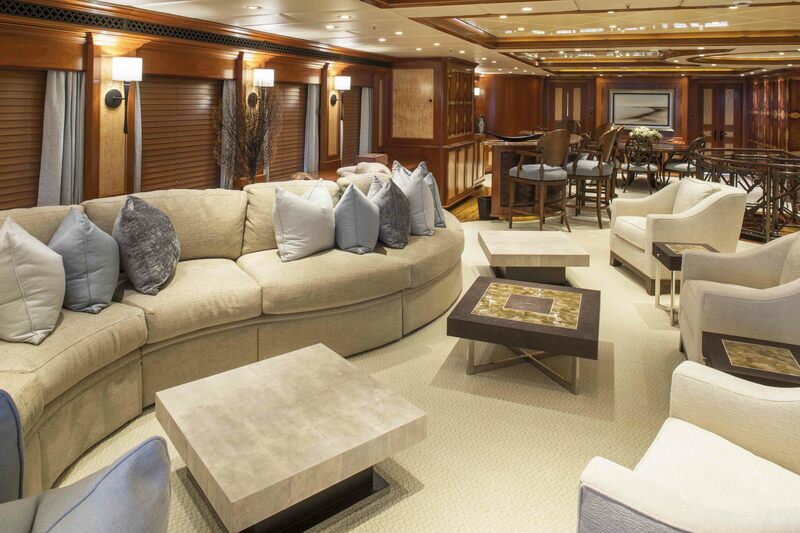 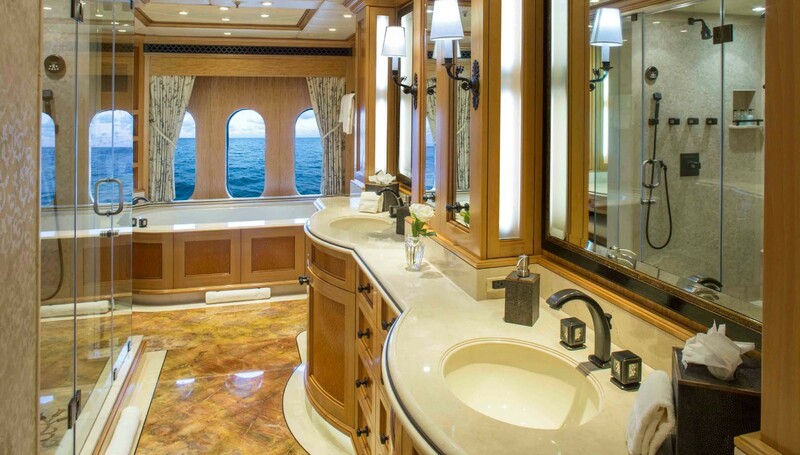 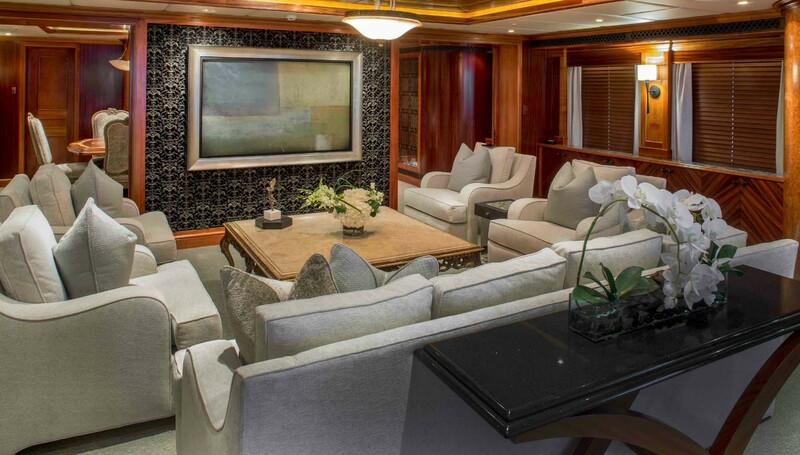 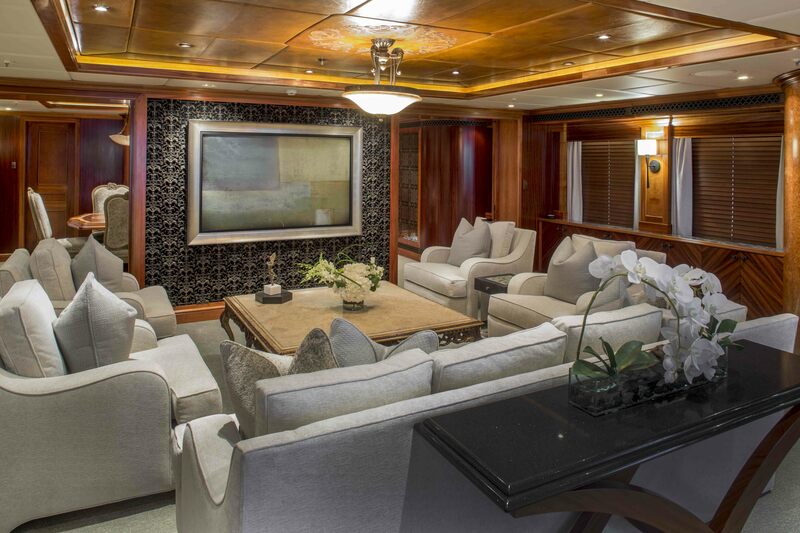 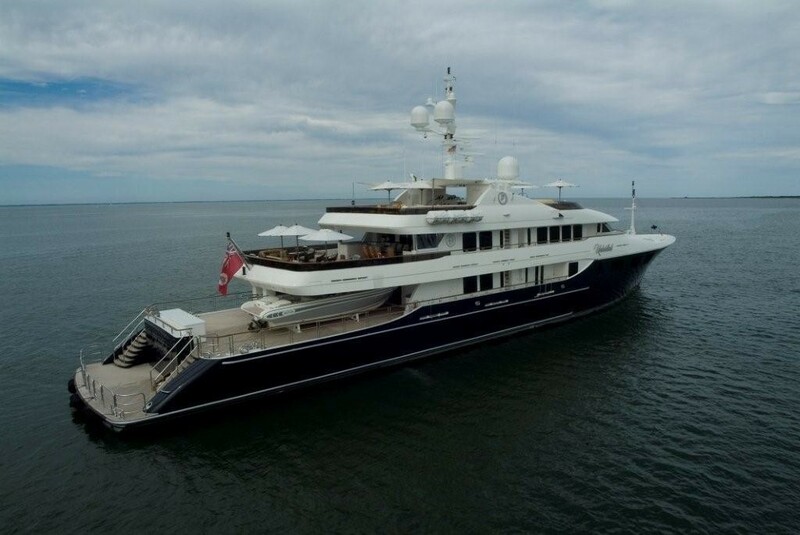 This crewed superyacht features a large sundeck. 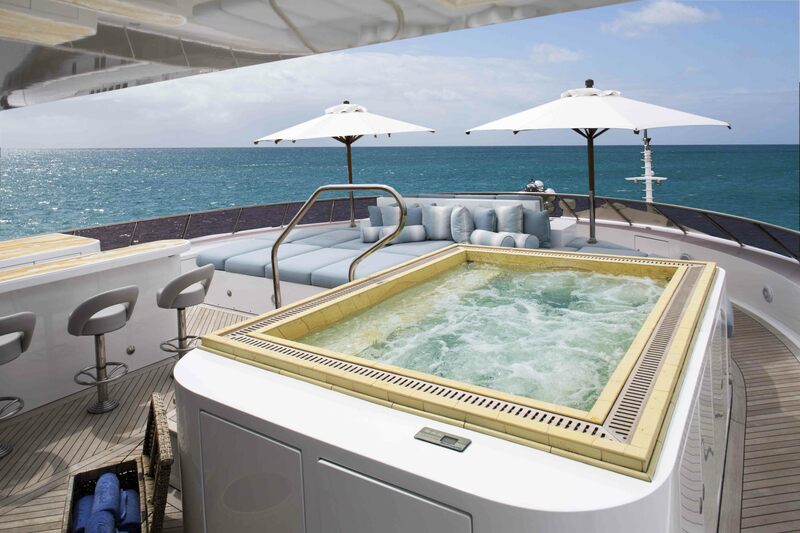 Here guests may wish to relax on the full beam sunpad, take a dip in the deluxe Spa Pool tub, work out on the gym equipment, dine al fresco, sip an aperitif from the wet bar or simply sit back and soak up the warm sun. 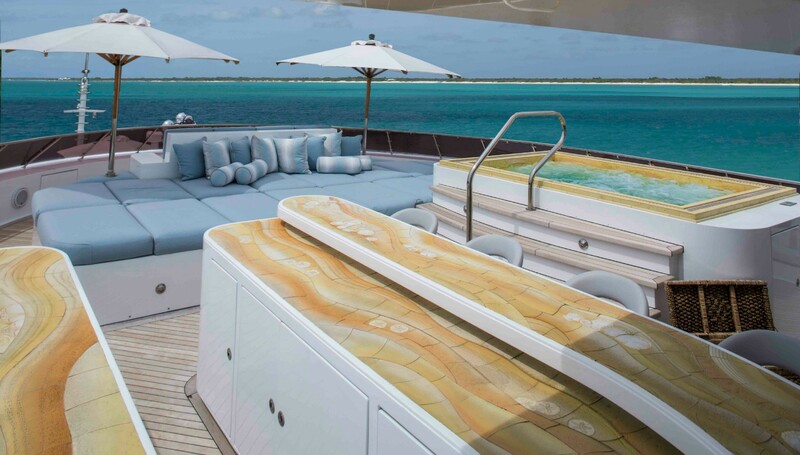 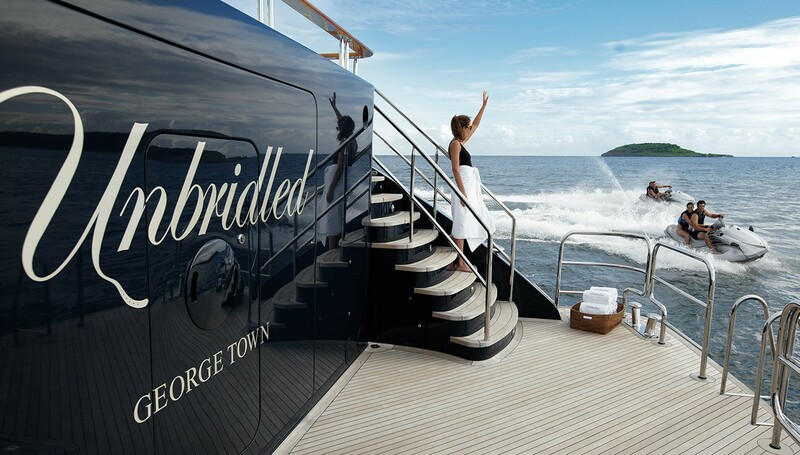 UNBRIDLED boasts a fabulous inventory of water toys, all effortlessly accessed from the extended swim platform and teak beach. 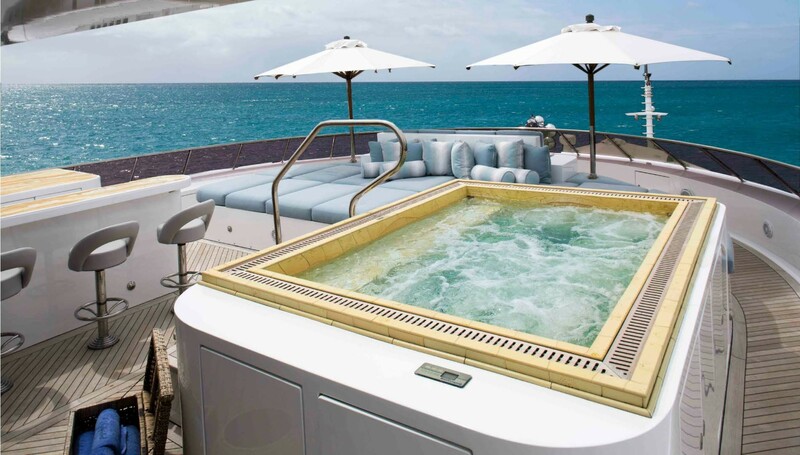 Thirteen dedicated and discrete crew are on hand to ensure guests aboard this beautiful yacht enjoy a relaxing and unforgettable luxury charter yacht experience. 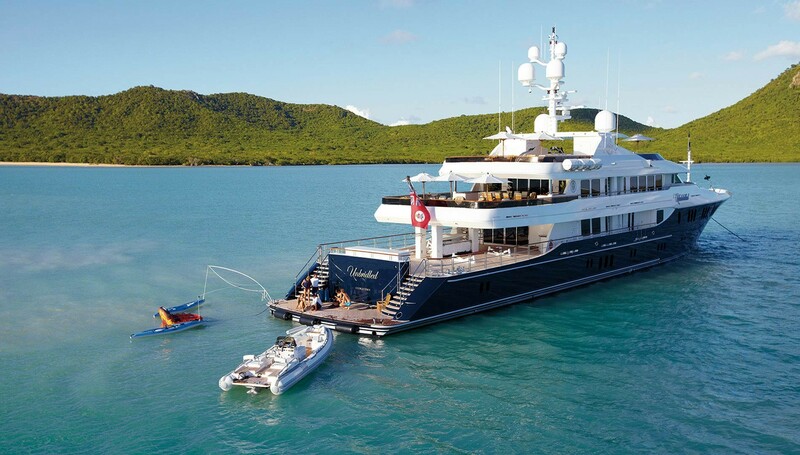 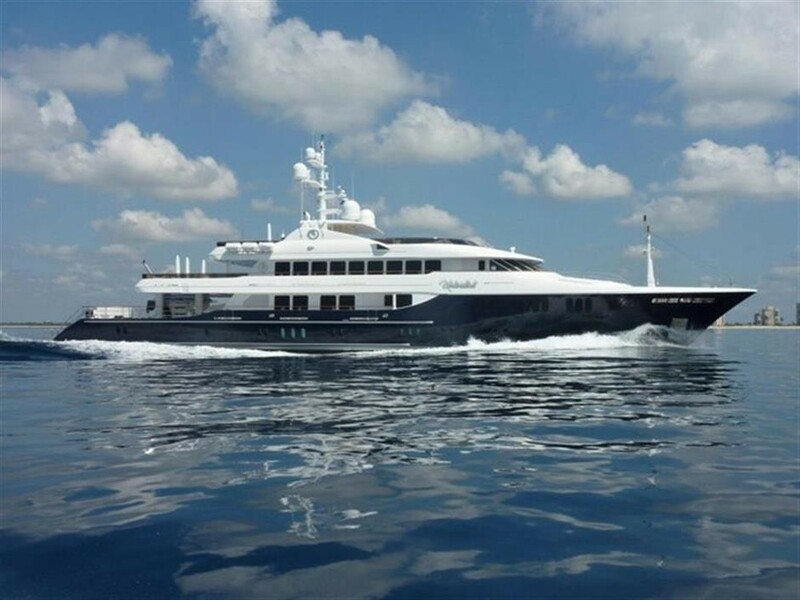 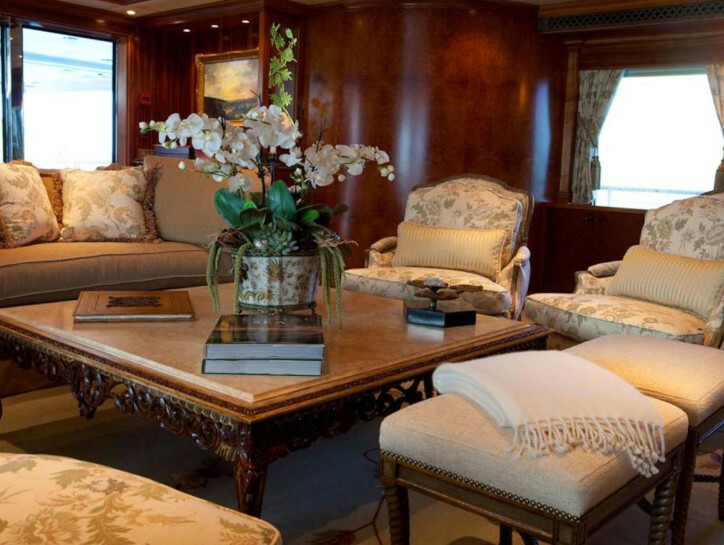 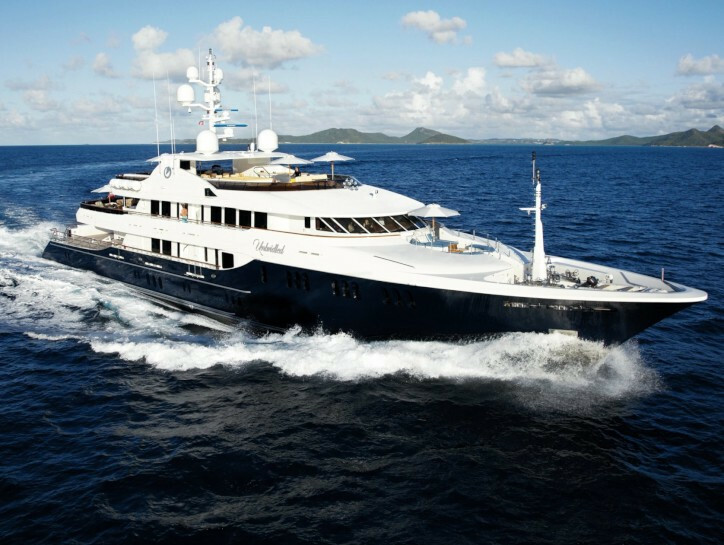 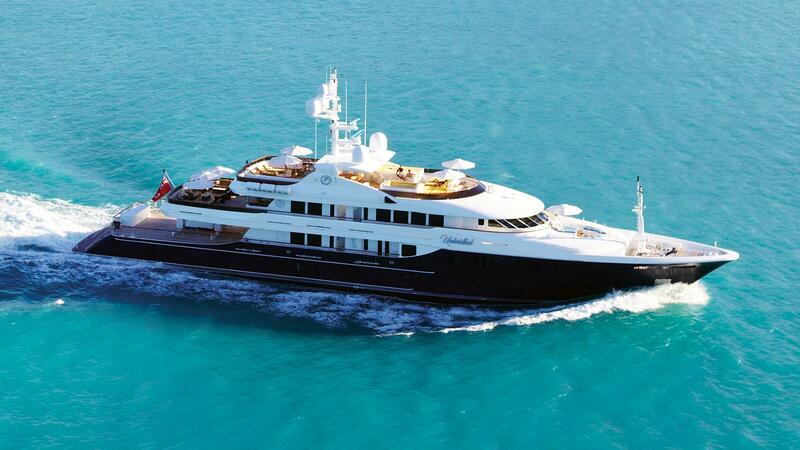 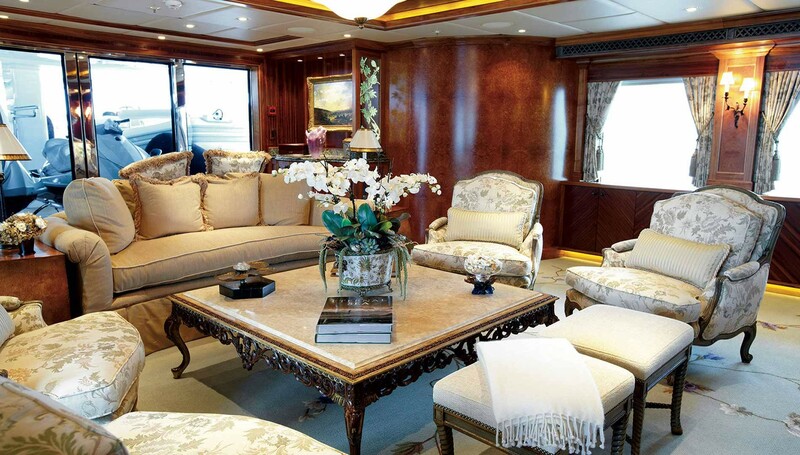 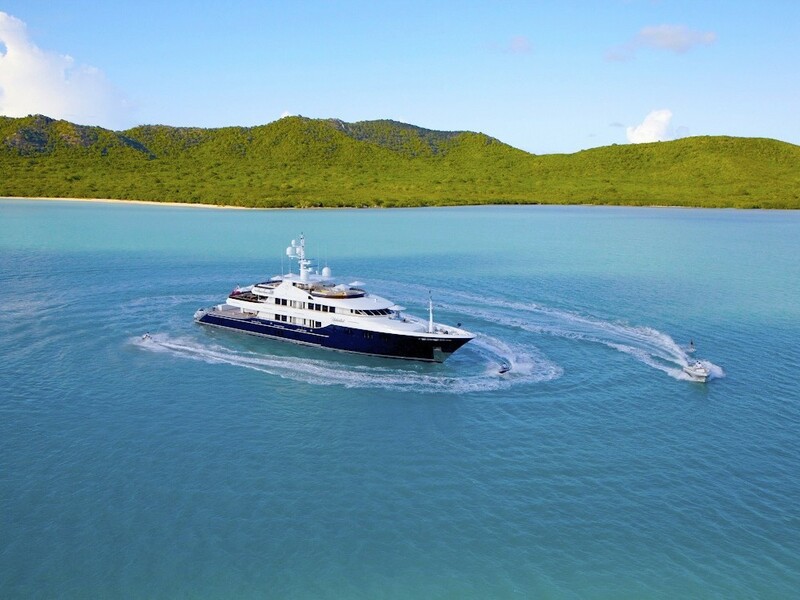 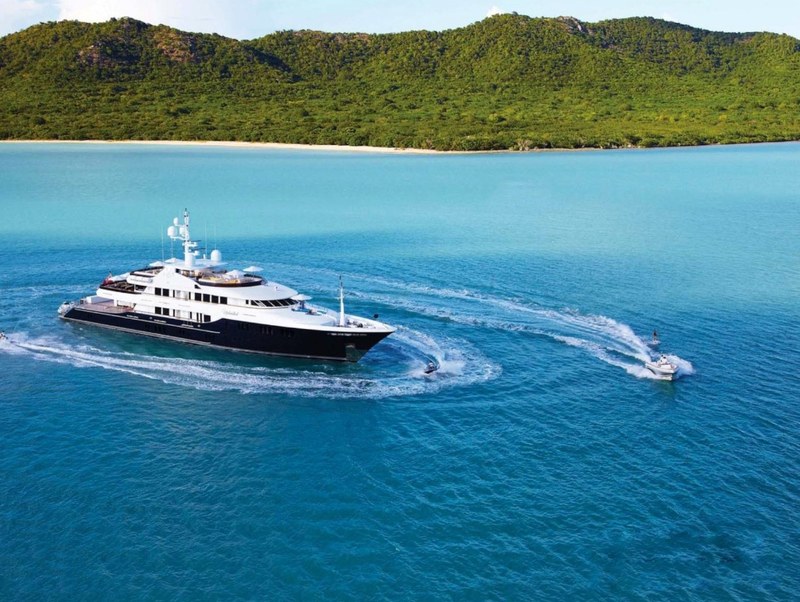 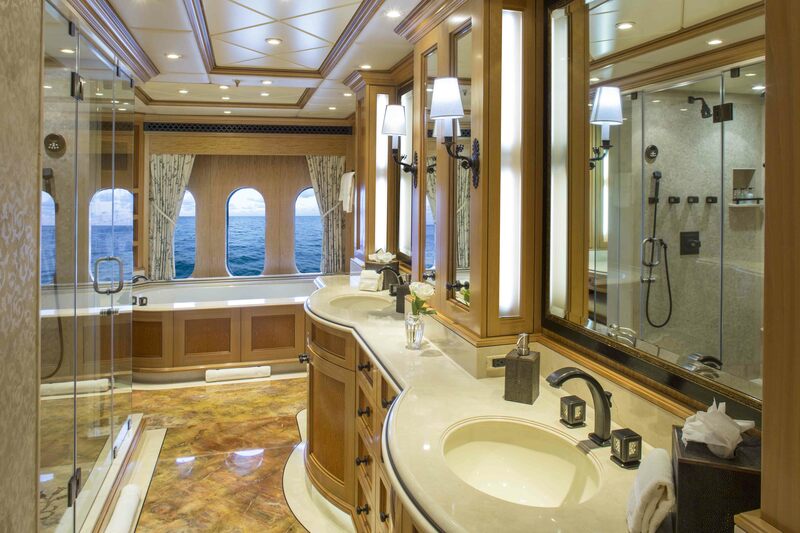 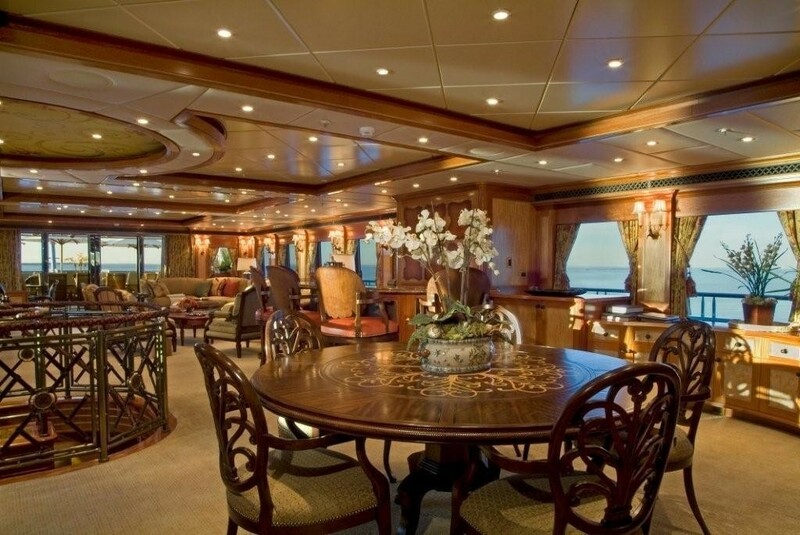 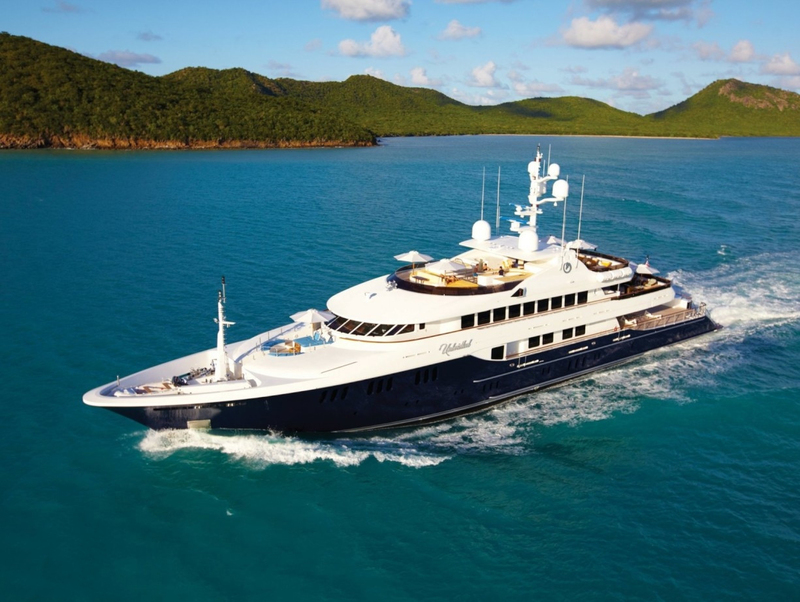 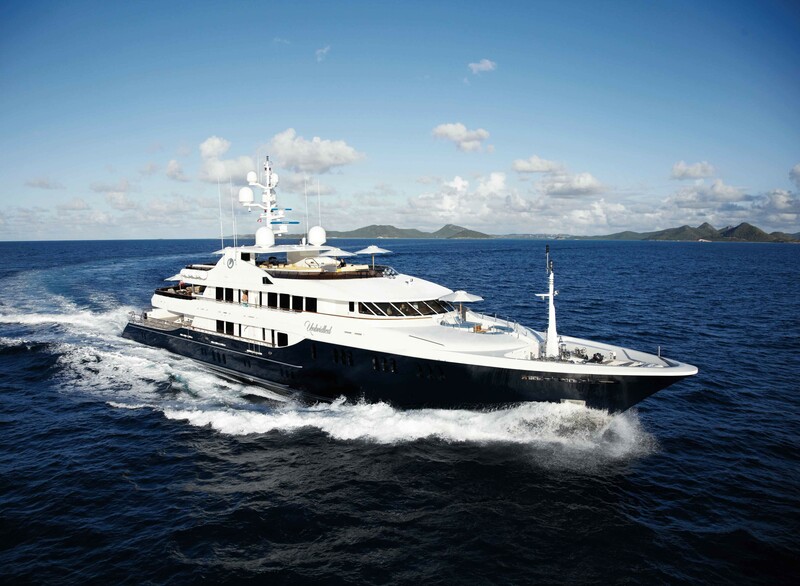 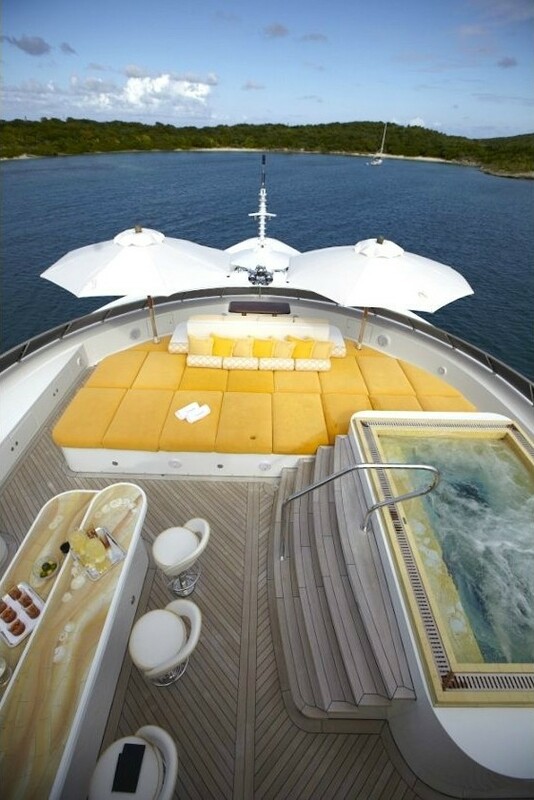 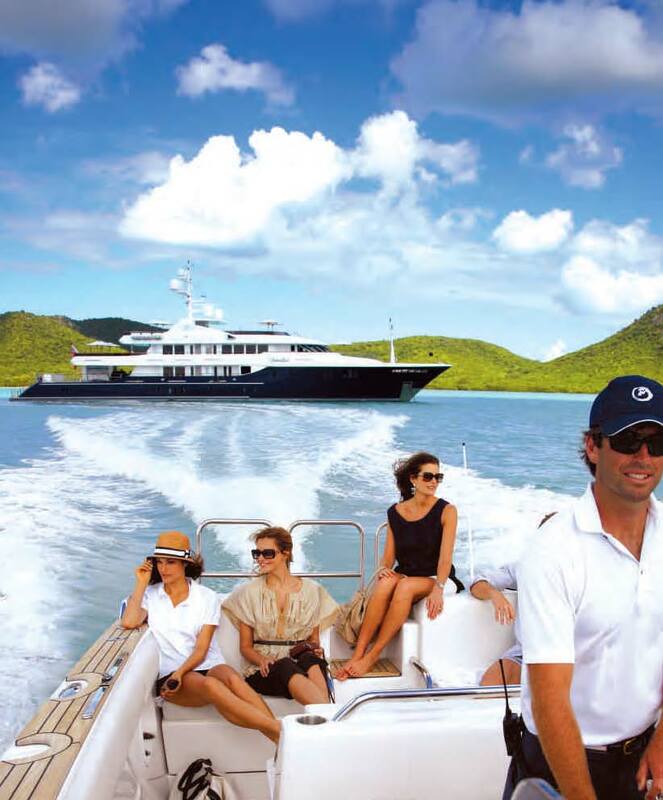 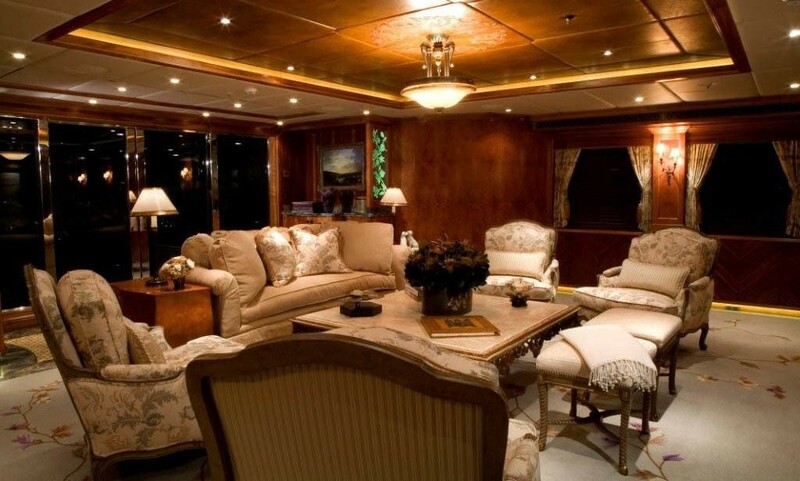 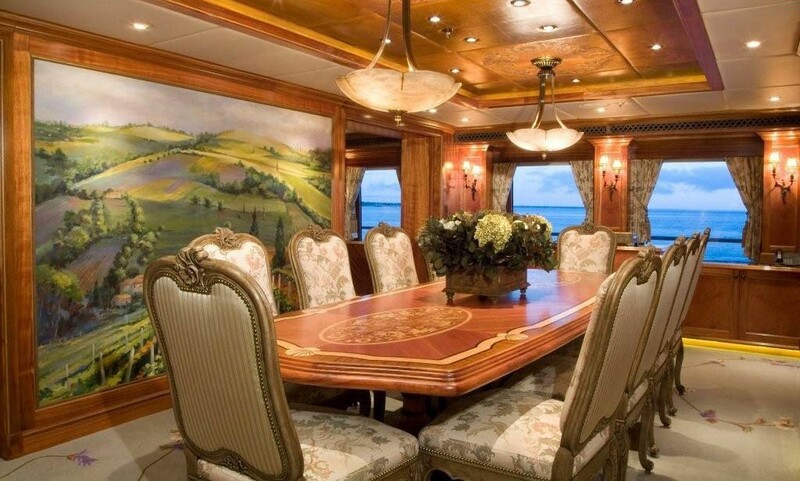 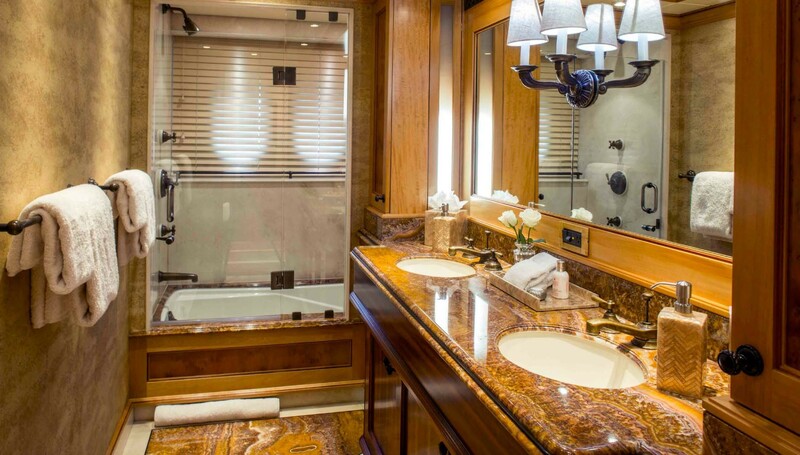 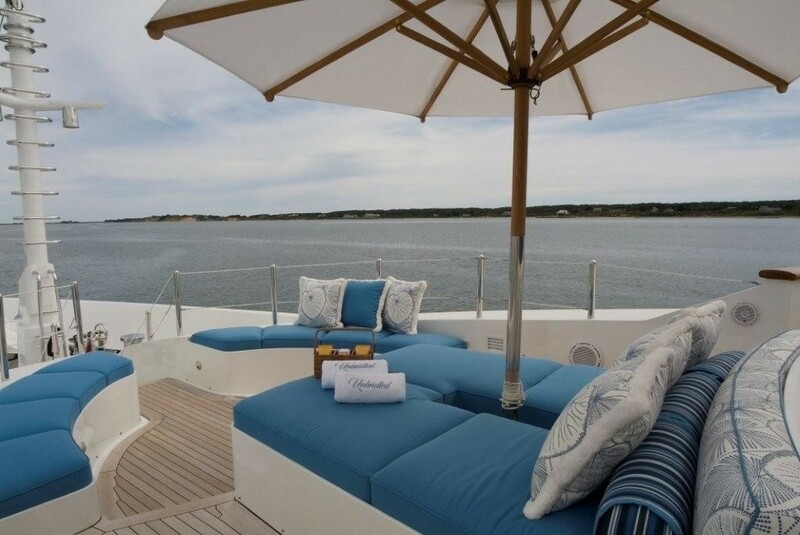 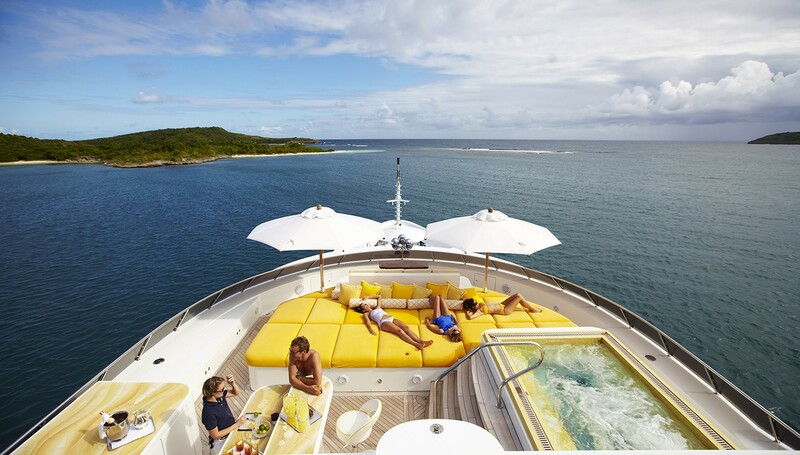 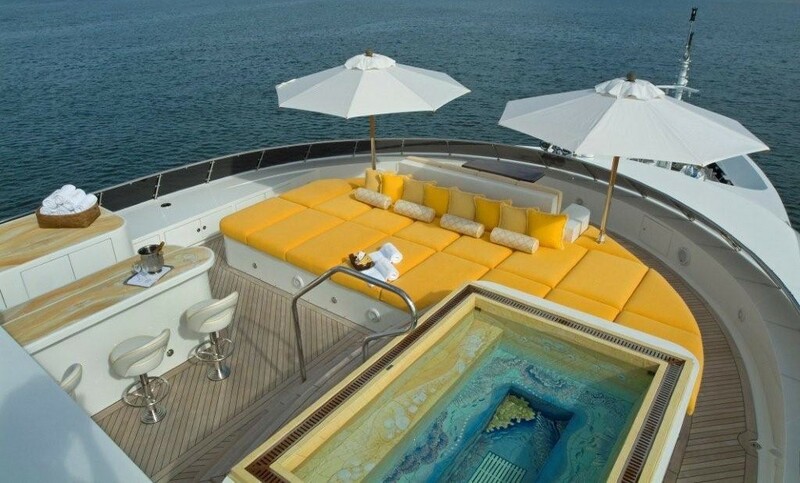 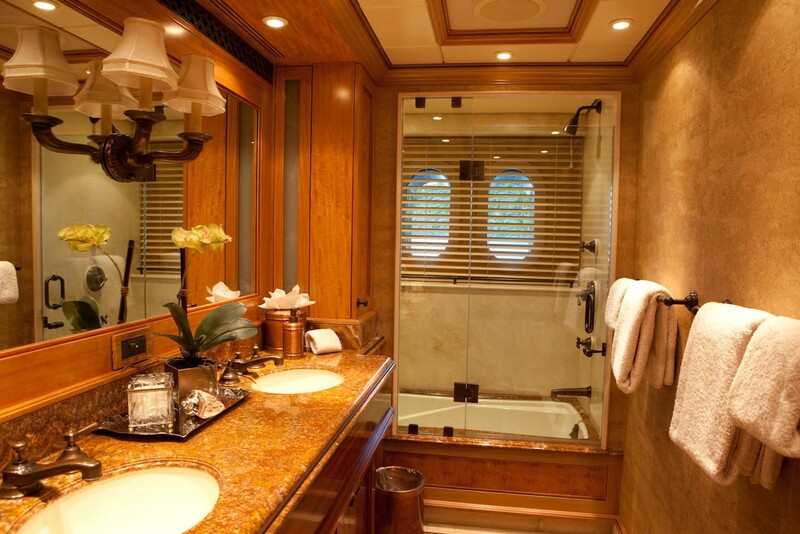 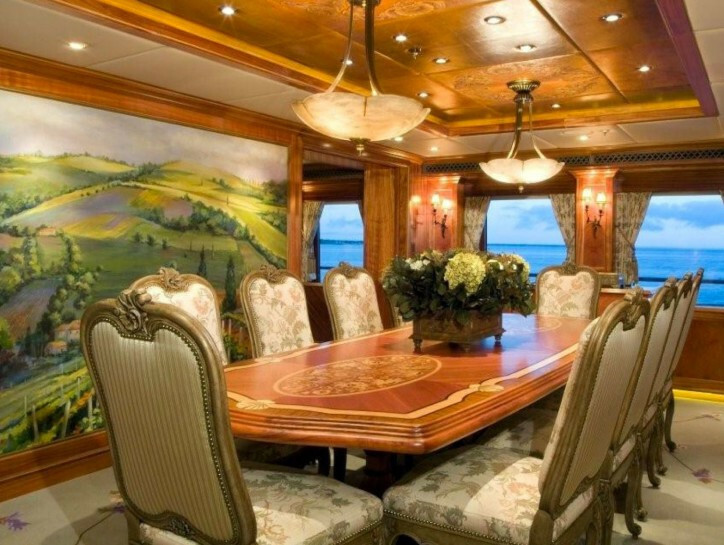 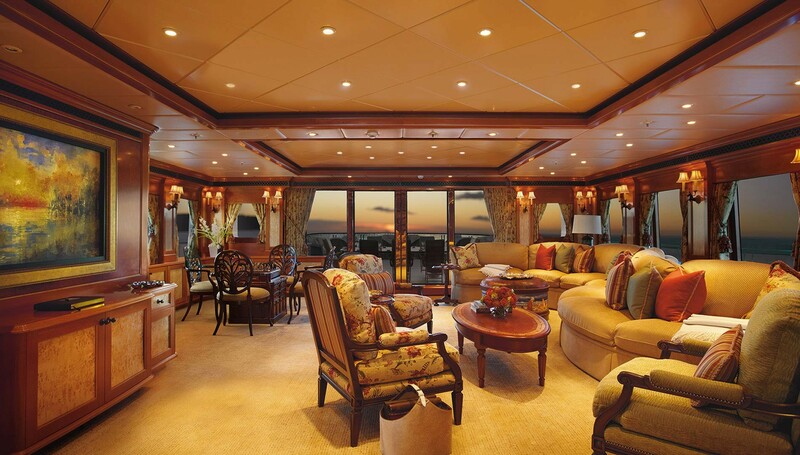 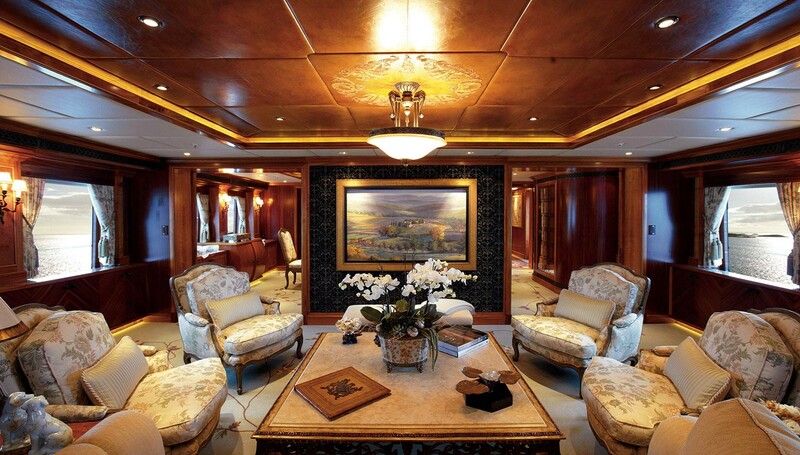 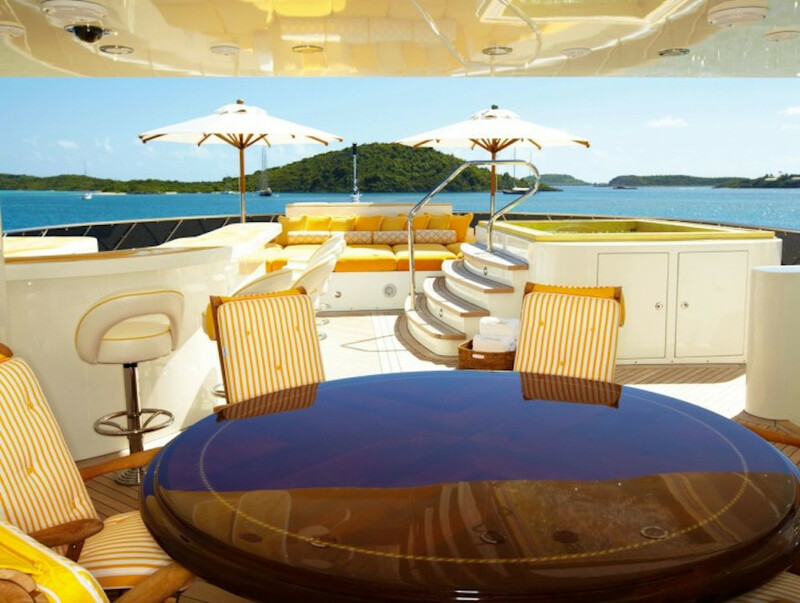 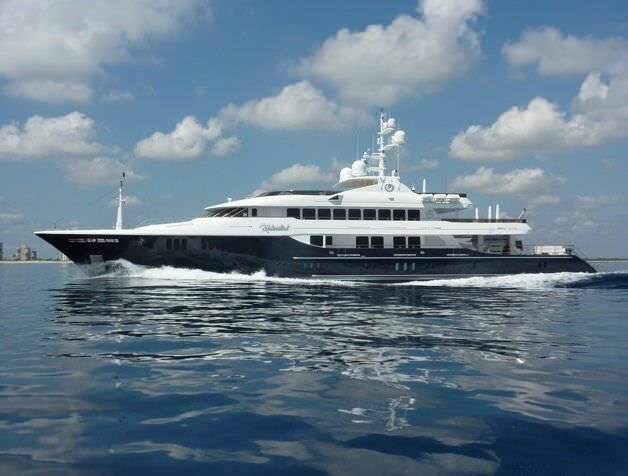 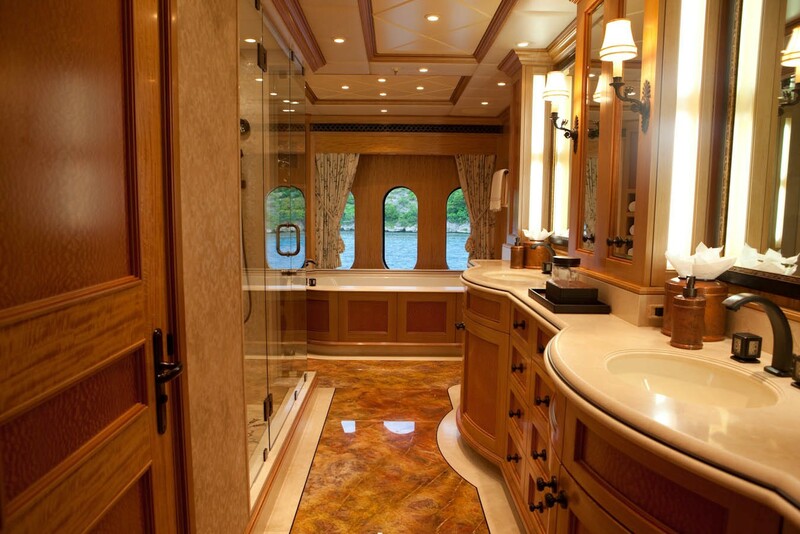 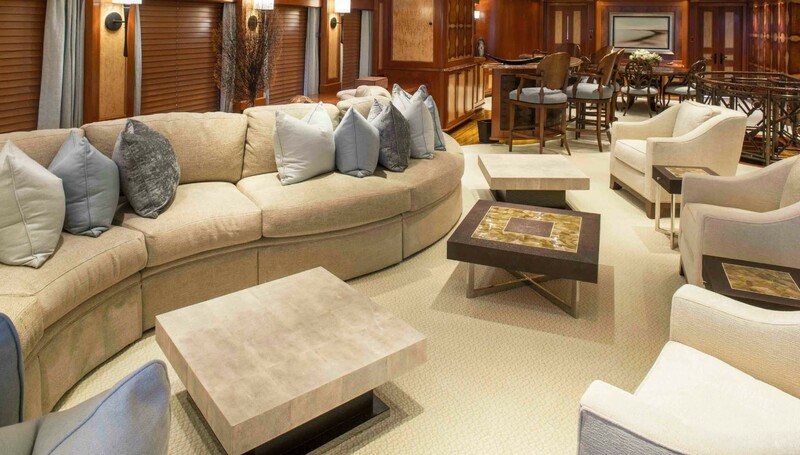 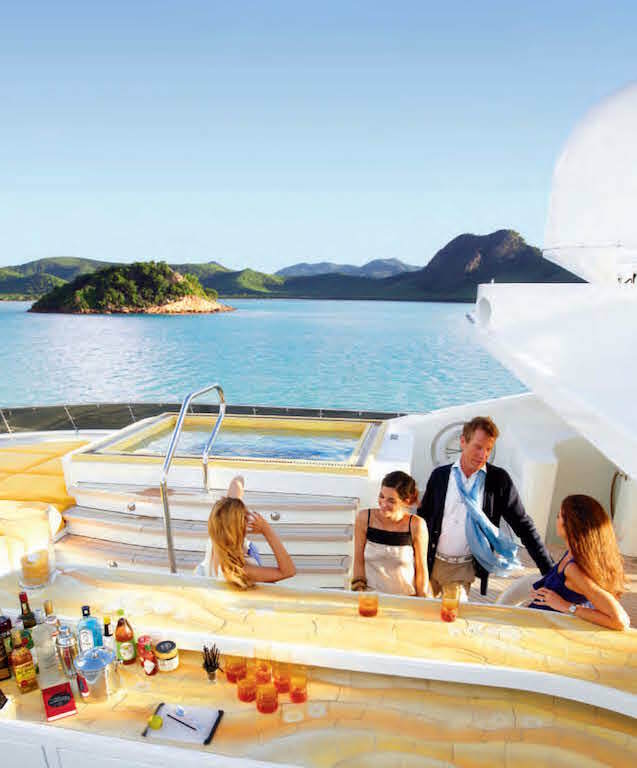 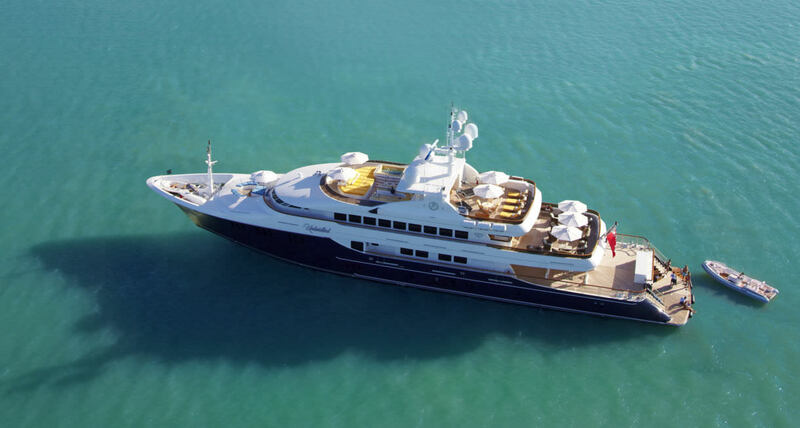 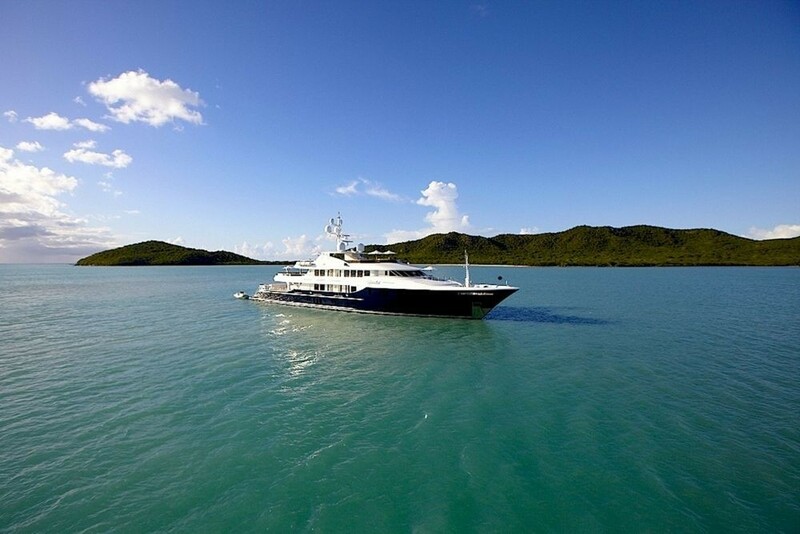 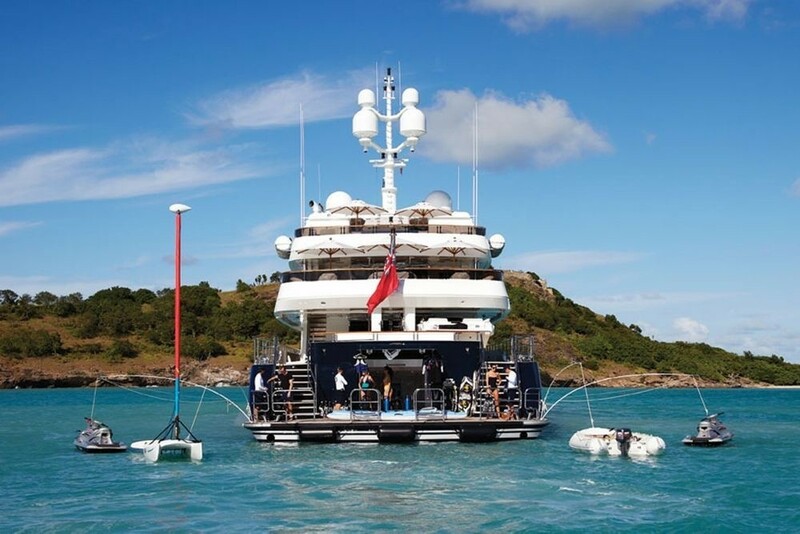 Luxury yacht UNBRIDLED offers accommodation for up to 12 guests. 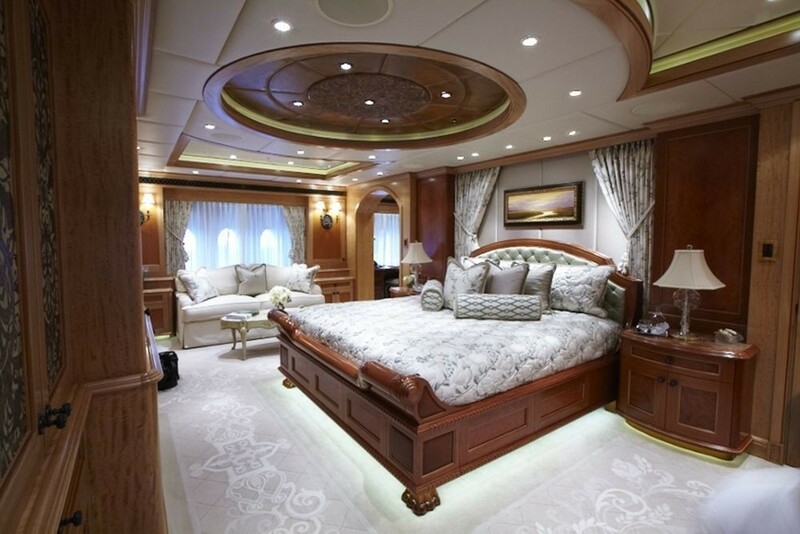 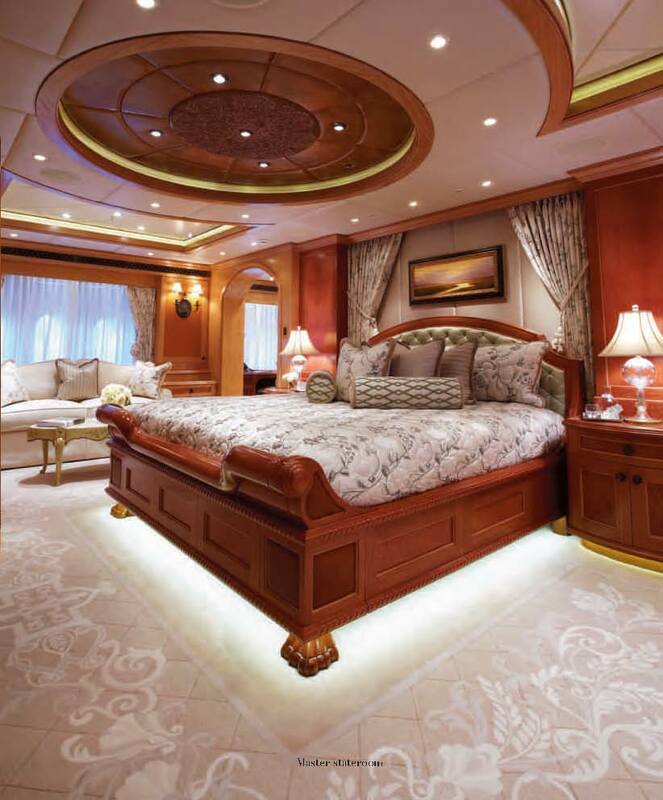 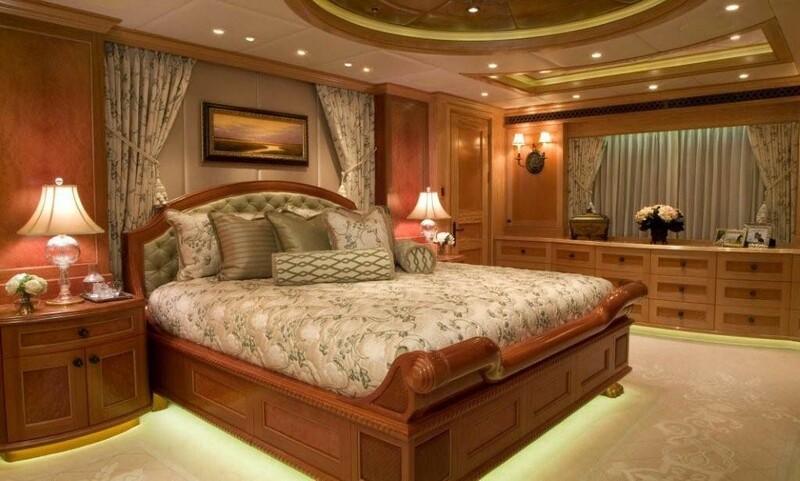 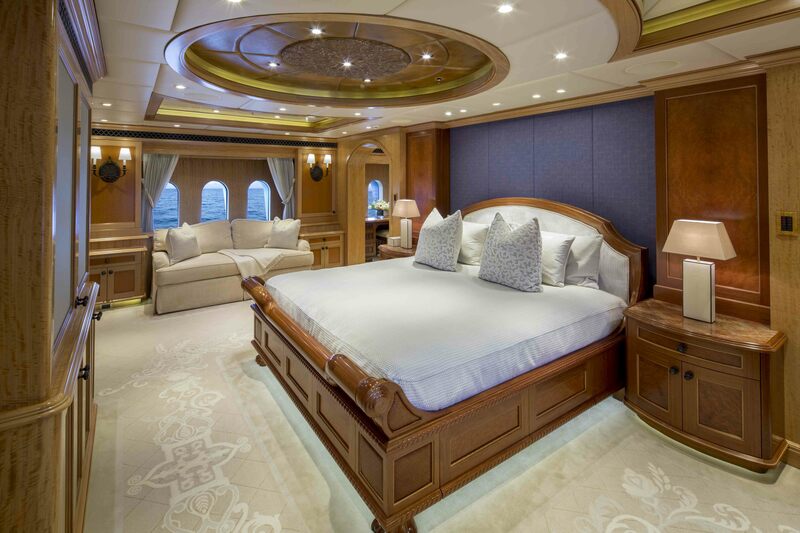 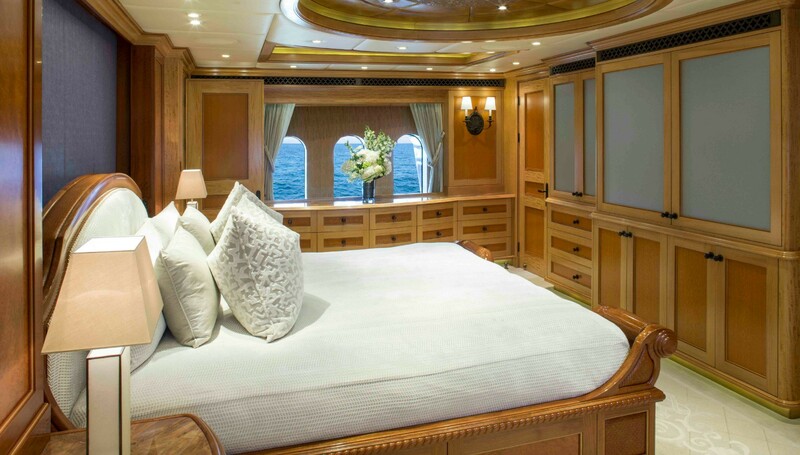 The master suite is forward on the main deck and full beam of the yacht with a king size bed, his and hers wardrobes, study and large en-suite. 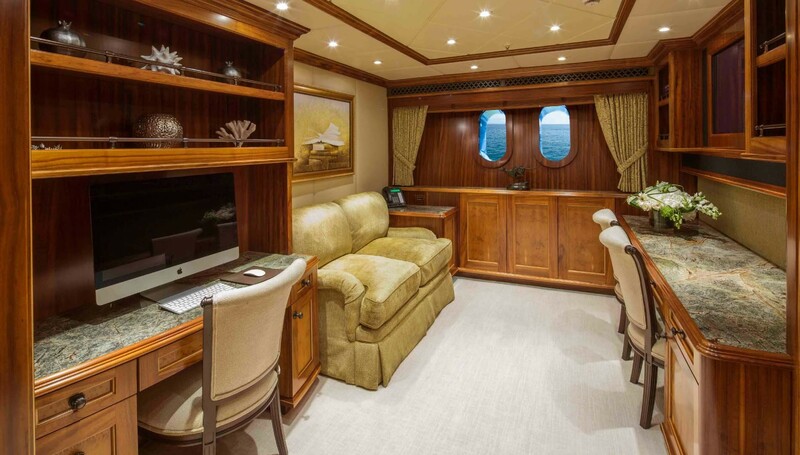 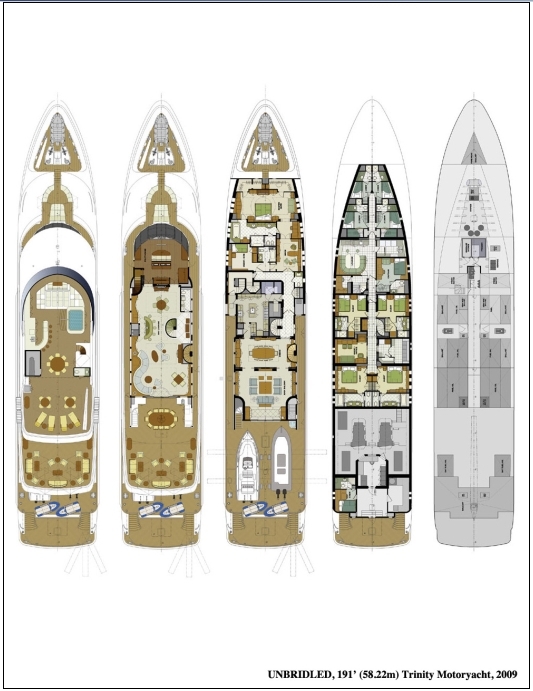 A further study/office is available on the main deck and can convert into a double cabin or a twin cabin and offers en-suite facilities. 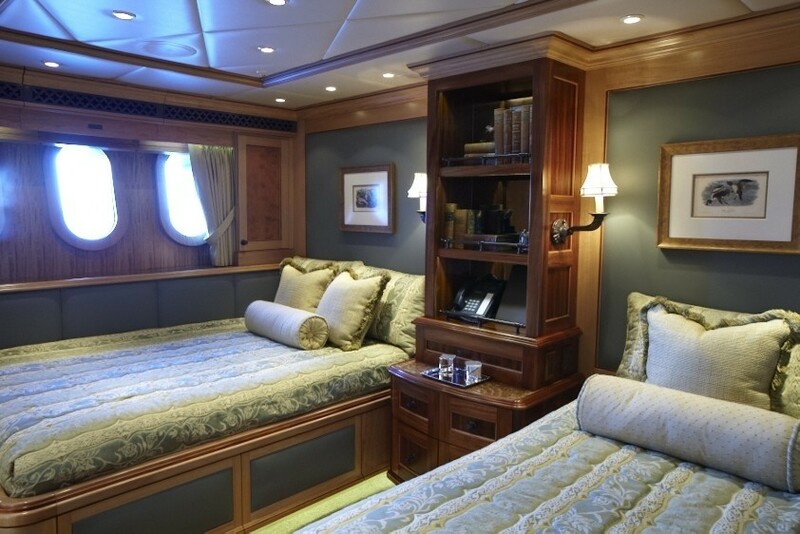 Below decks, 2 VIP cabins have queen side beds and 2 further guest cabins offer side by side twin beds. 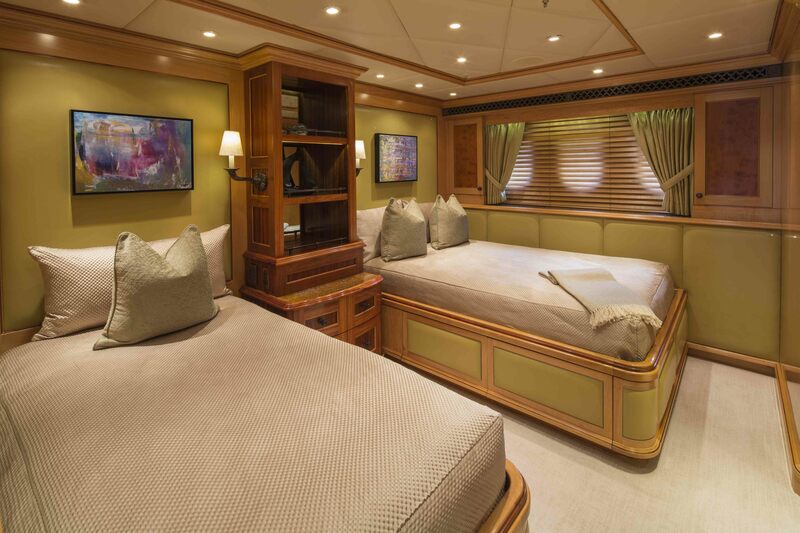 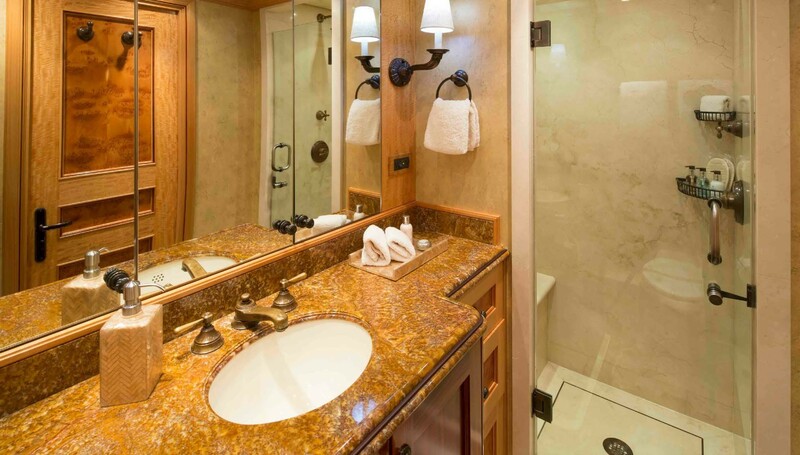 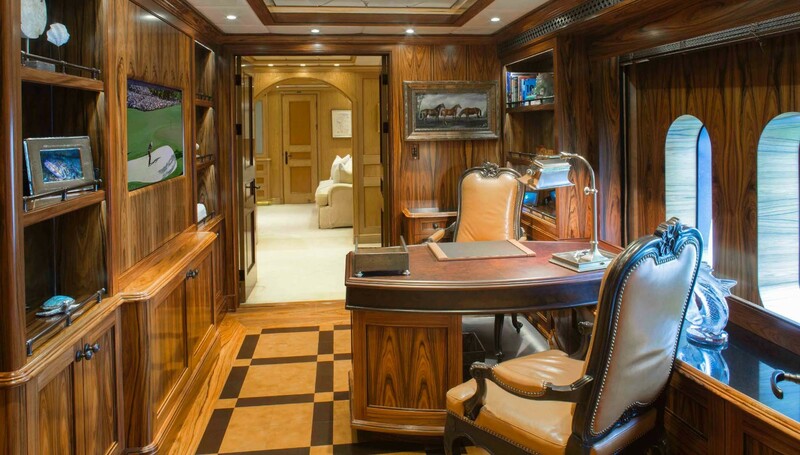 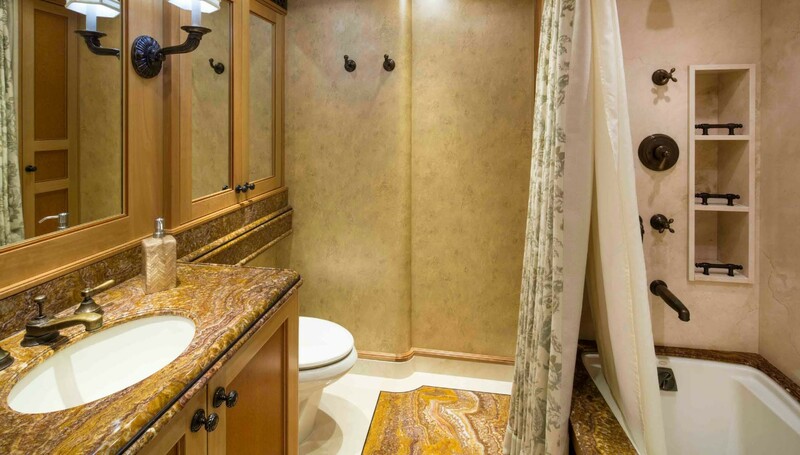 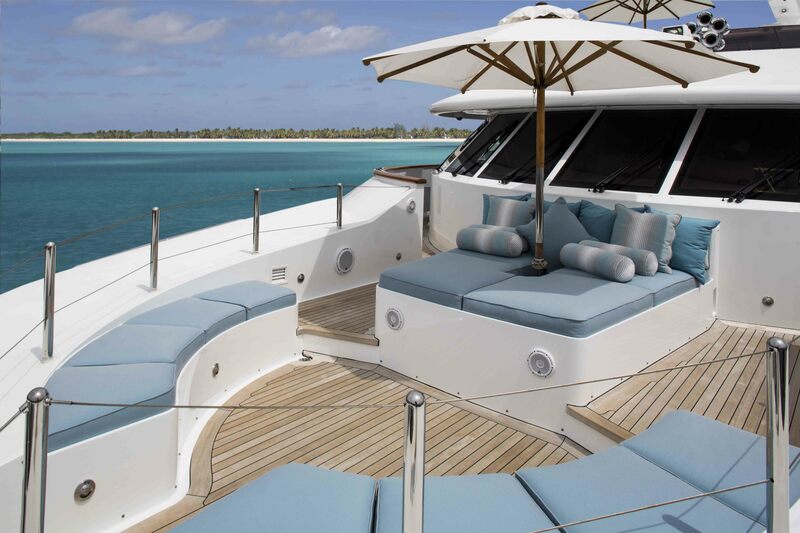 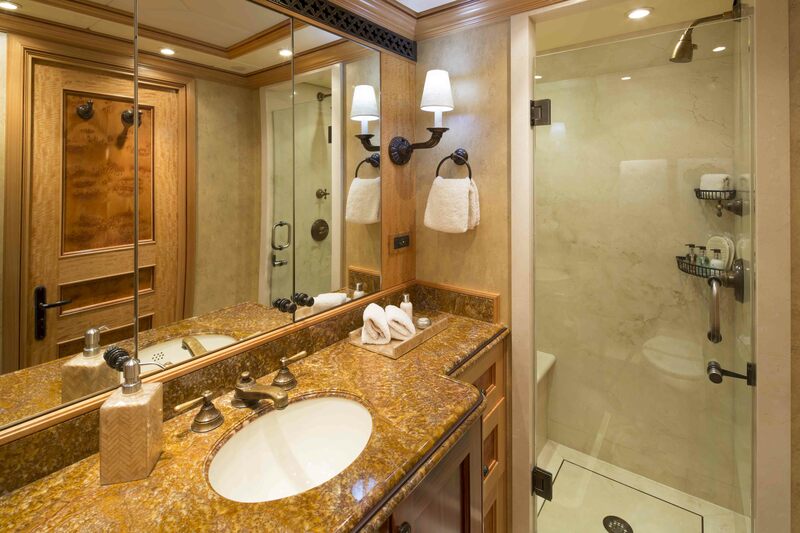 All the cabins have been finished to the high standard that runs throughout the yachts impressive interior. 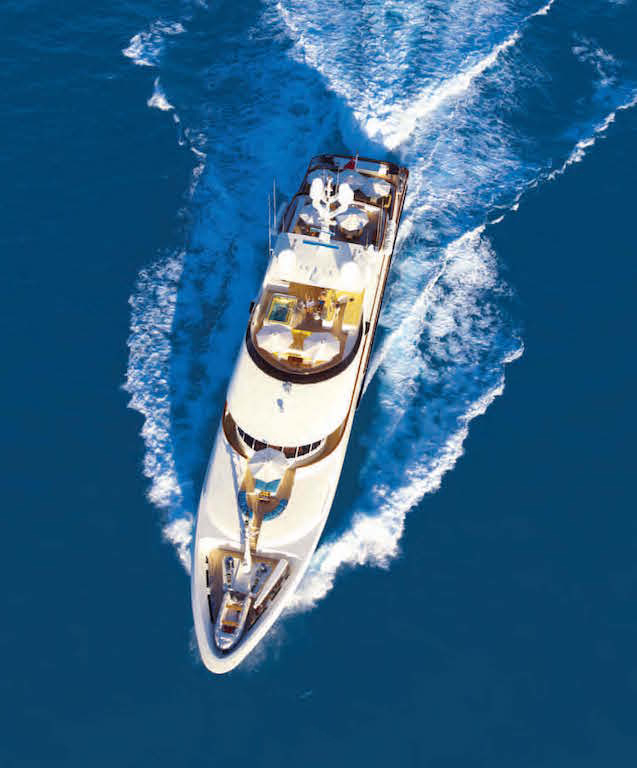 Tenders & Toys 9.3m Novurania tender with 350hp inboard turbo diesel, 7.5m Novurania tender 230hp inboard diesel jet drive, 2 x Yamaha wave runners, 2 x 15' exercise/exploring kayaks, waterskis and tows, snorkeling gear, dive gear with compressor and nitrox. 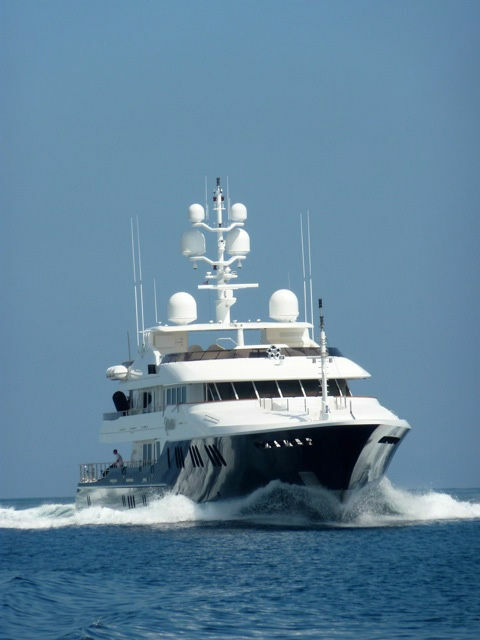 Communications Satcom and cellular communications facilities, internet access/wifi through. 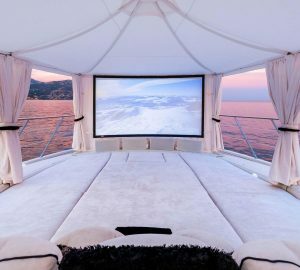 Audio Visual Equipment and Deck Facilities State of the art Creston audio visual system with Kaleidescape movie system, satellite television. 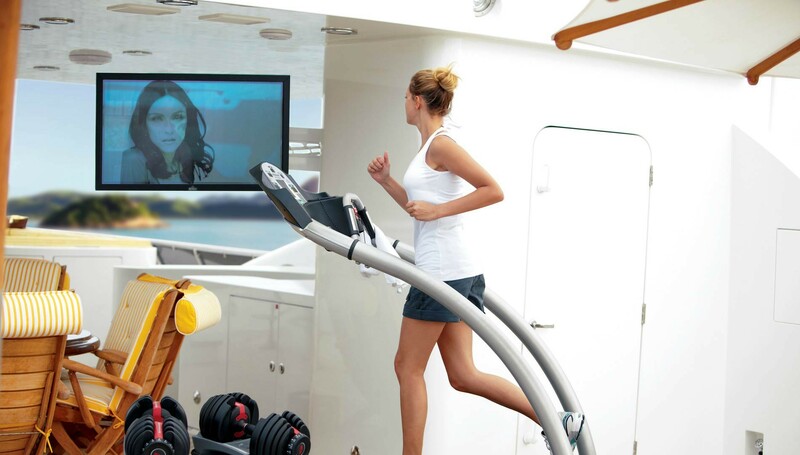 Outdoor gym facilities, sun deck bar, and spa pool.